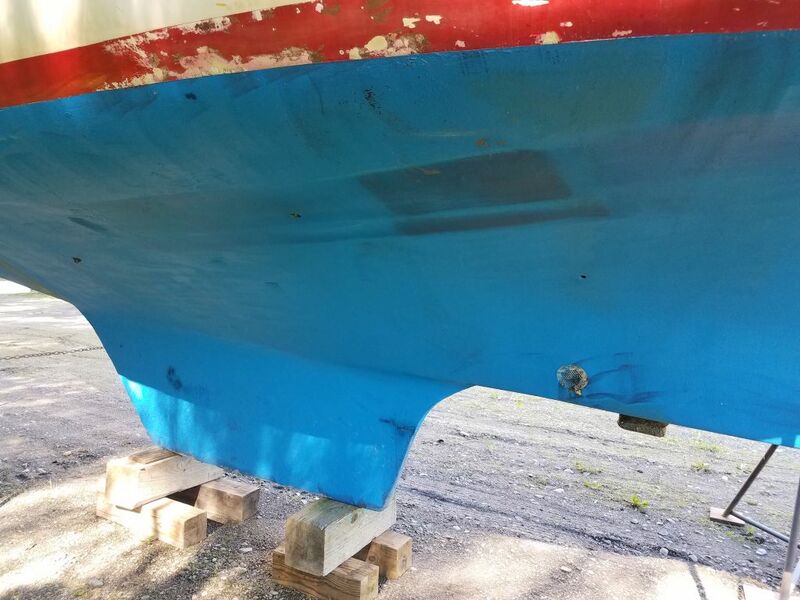 The bottom looks to be in pretty good shape, at least as far as the outward appearance. 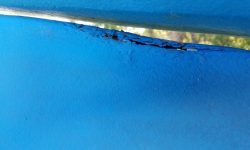 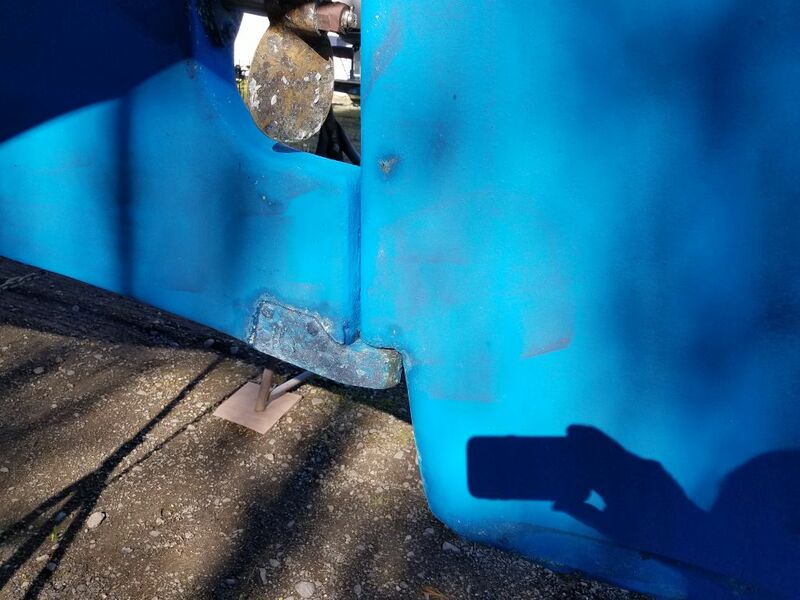 The bottom paint is sound and not overly thick, and there are no obvious signs of damage visible through the paint. 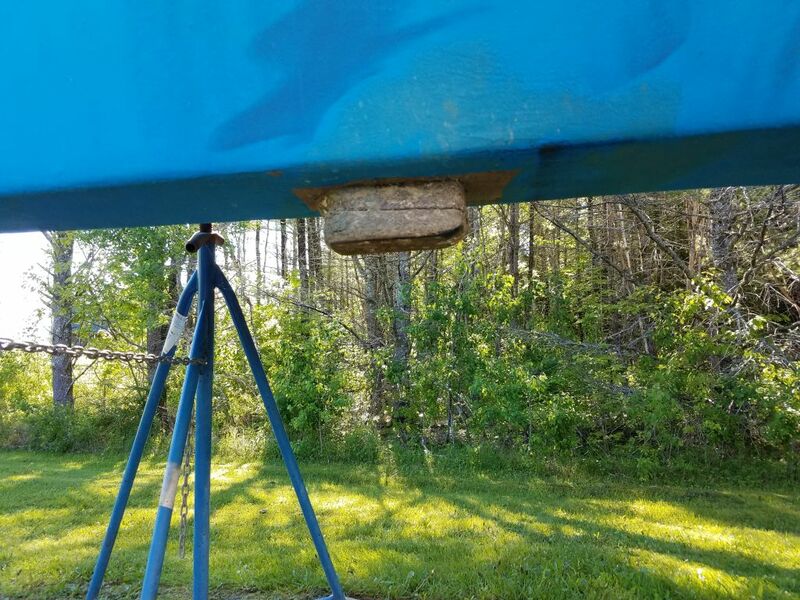 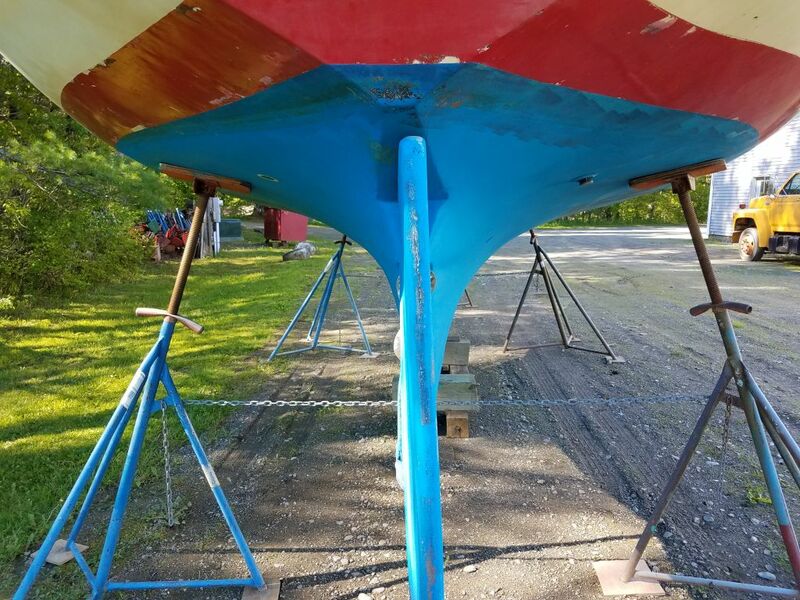 The rudder has some issues top and bottom and will require attention. 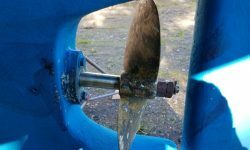 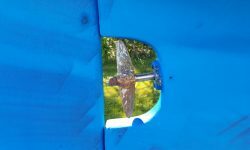 The propeller aperture is very small, and enlarging it may prove to be desirable or required depending on the course we choose with the engine. 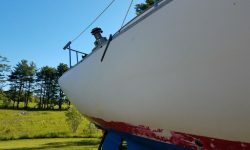 Stripping the bottom will help determine whether there are any underlying issues, but isn’t strictly necessary either. 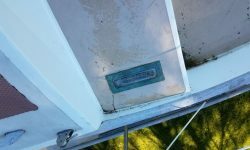 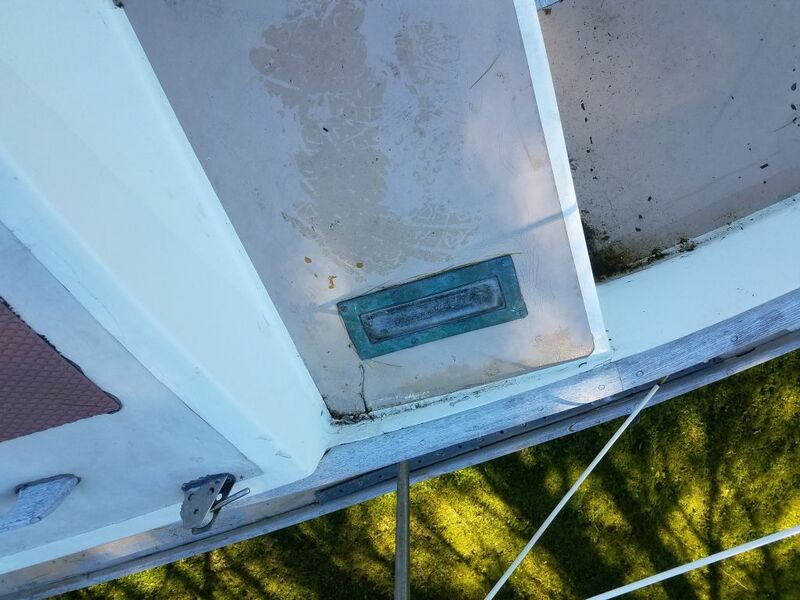 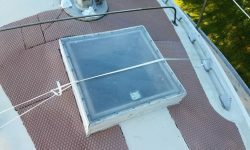 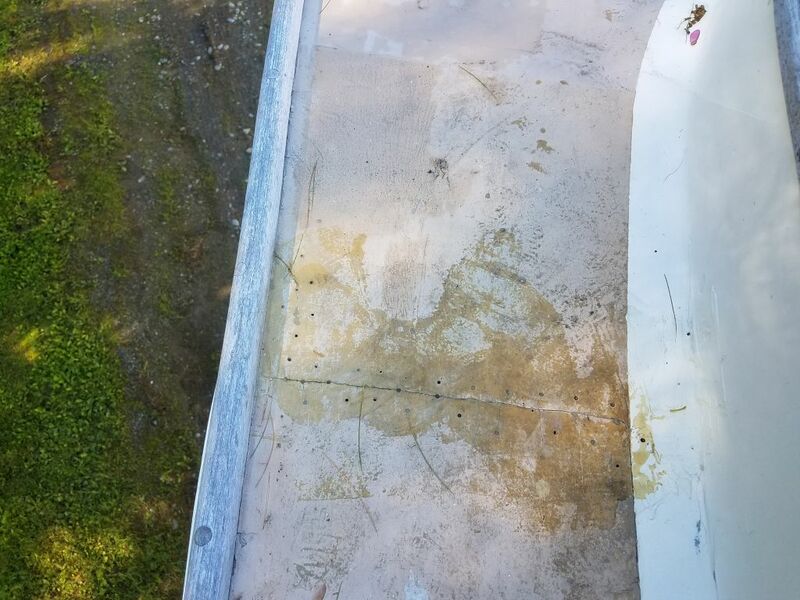 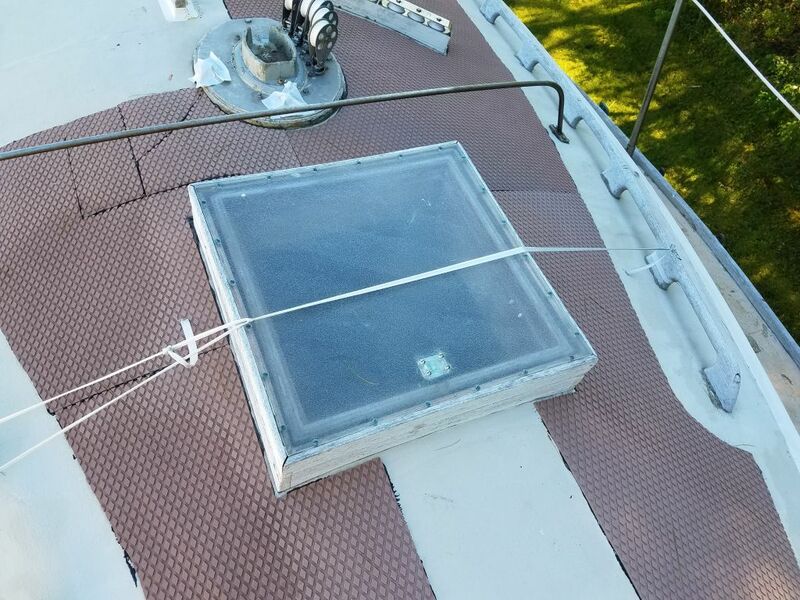 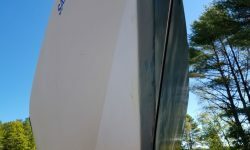 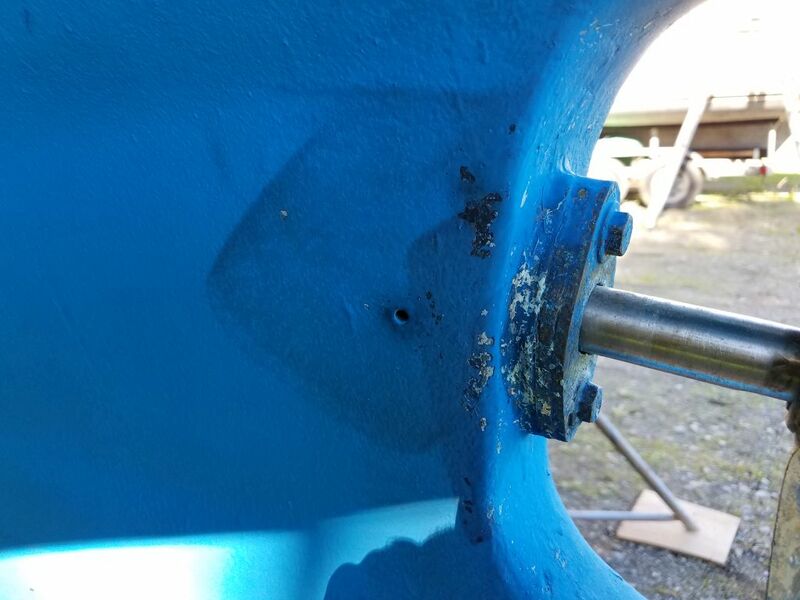 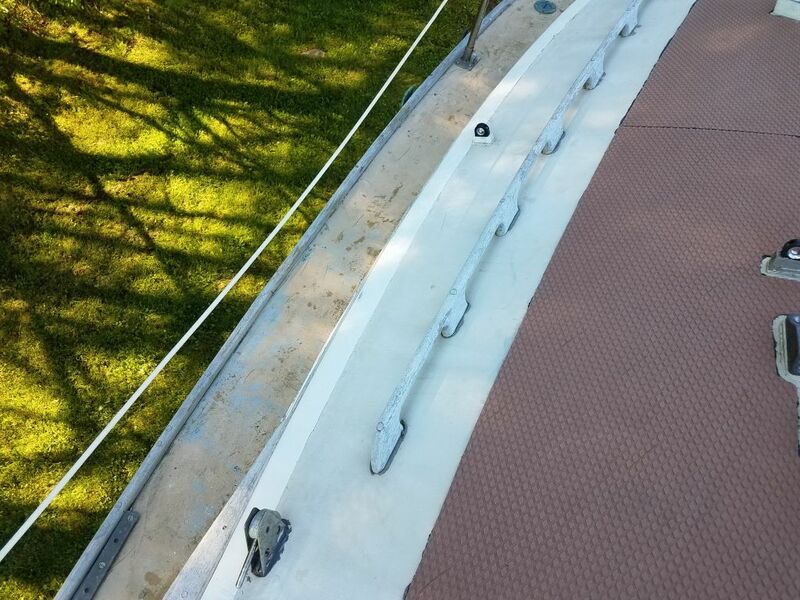 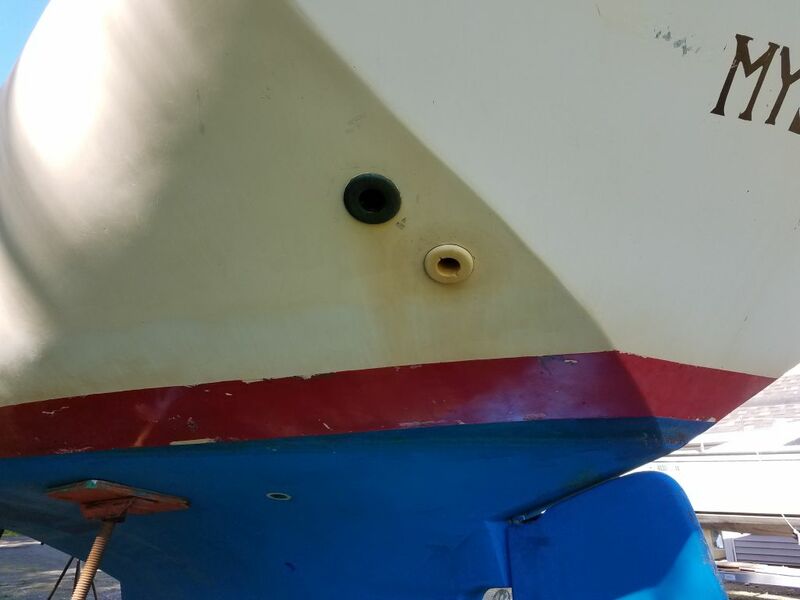 The topsides are in cosmetically poor condition with various indications of previous damage (i.e. 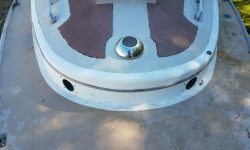 docking incidents, etc.) 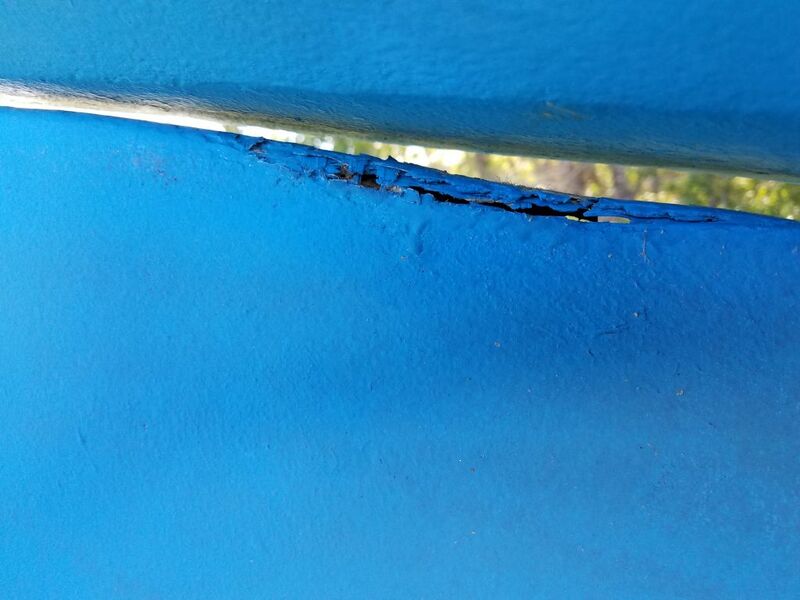 and poorly-executed repairs. 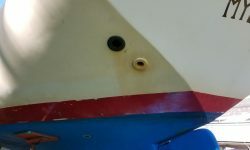 These areas are visible near the stem on both sides, and most notably along much of the port side of the hull. 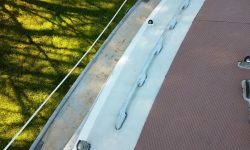 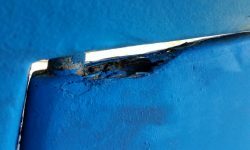 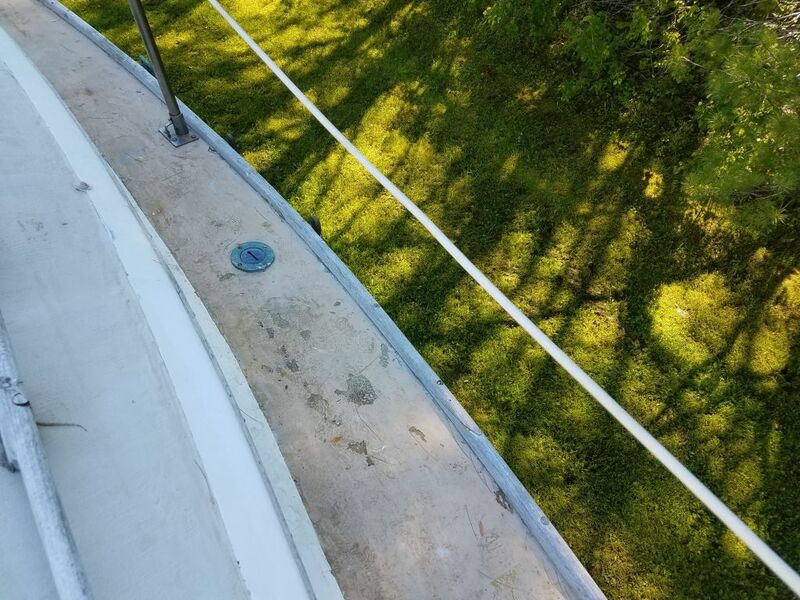 Normal surface prep procedures will help highlight any real issues, if any, and will also address these cosmetic interruptions during the natural course of the work. 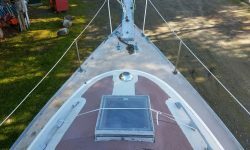 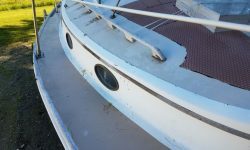 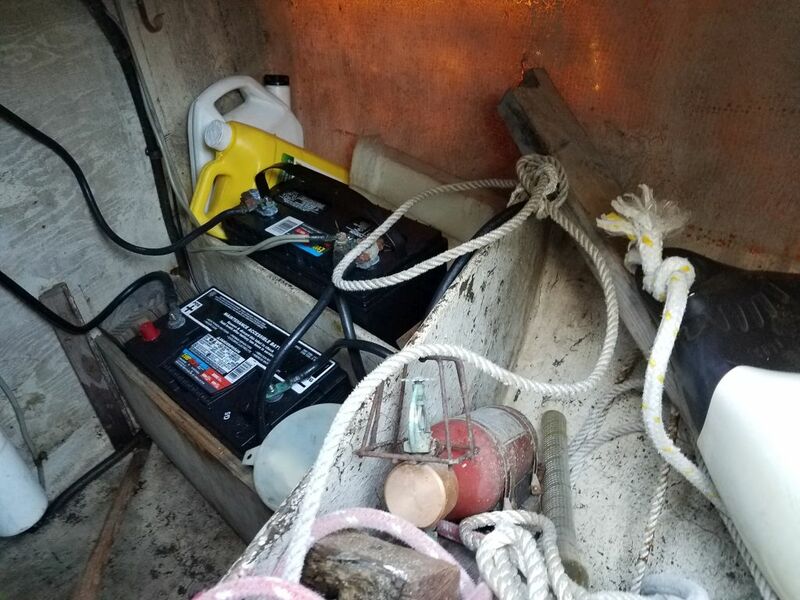 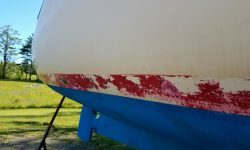 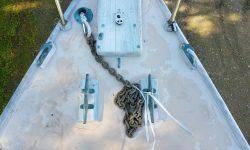 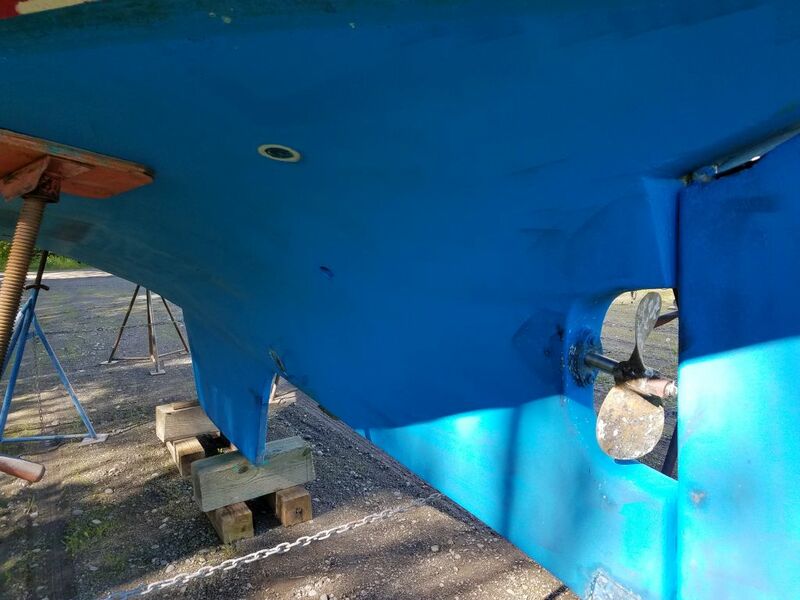 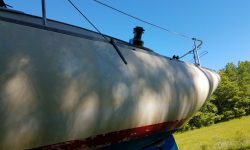 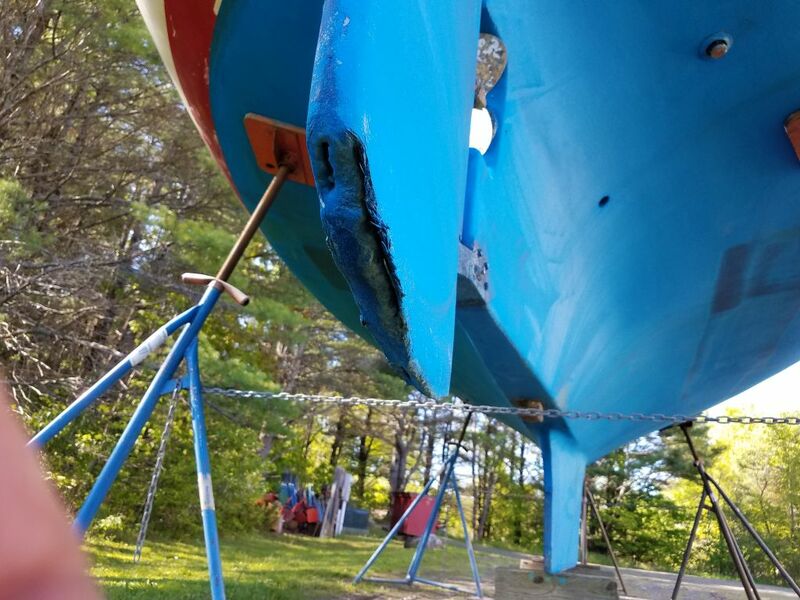 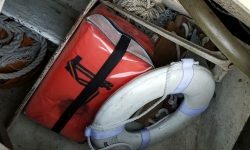 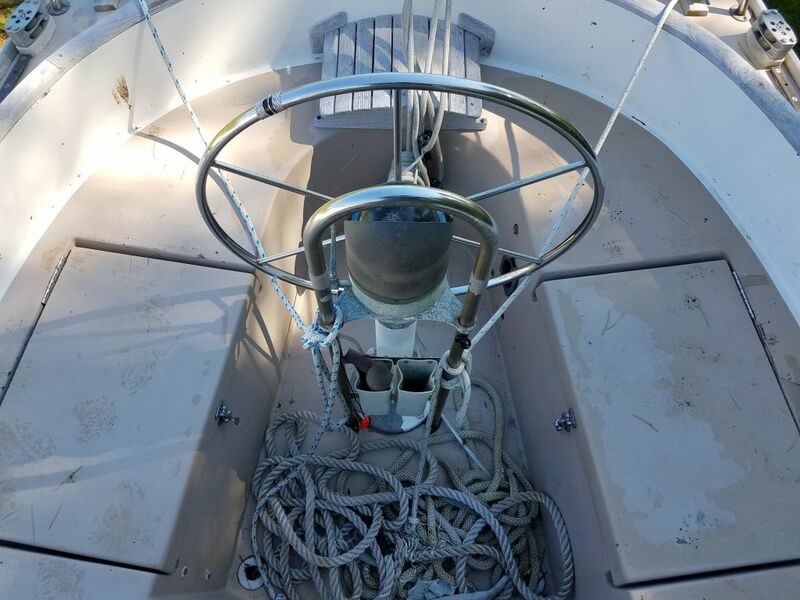 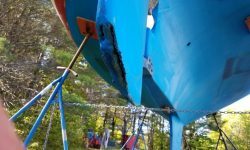 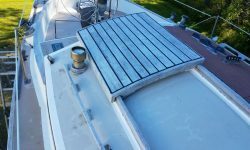 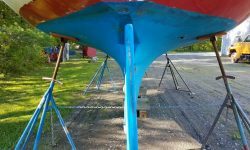 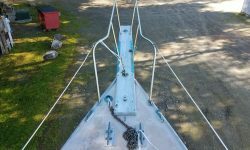 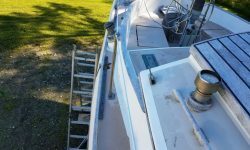 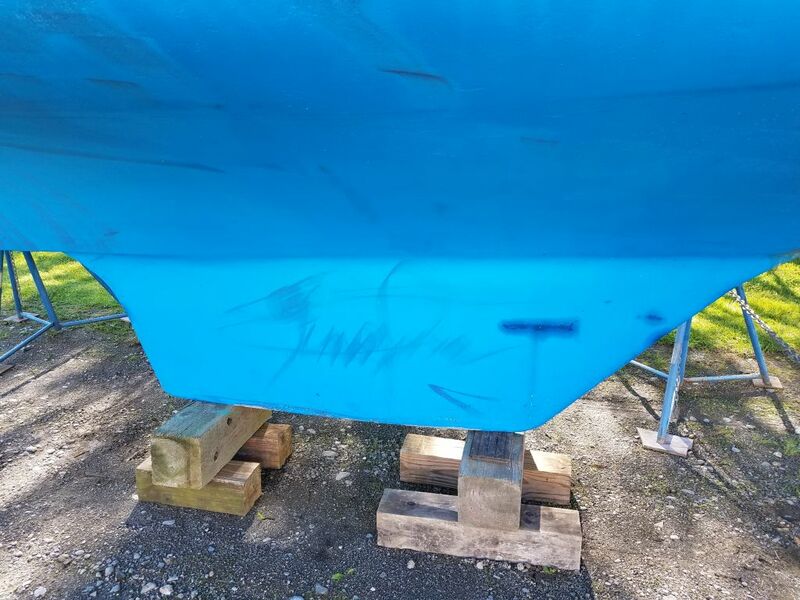 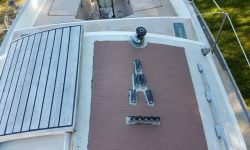 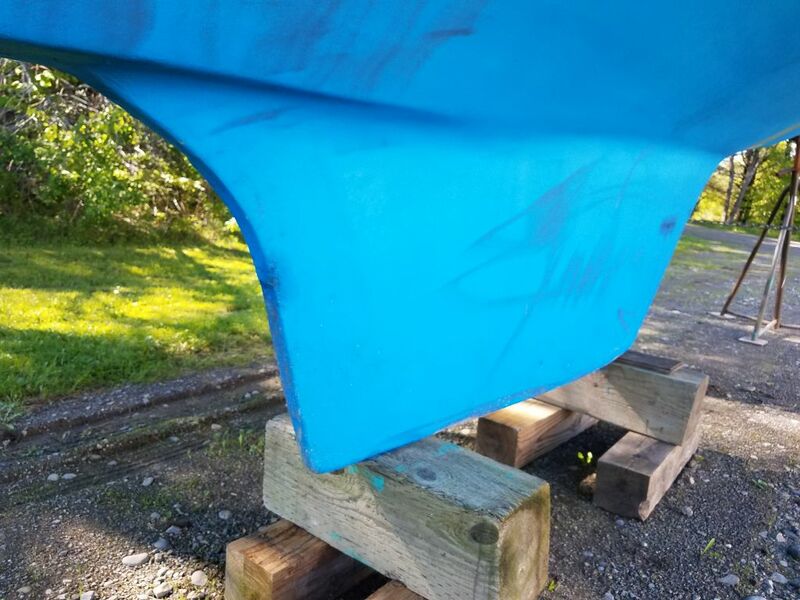 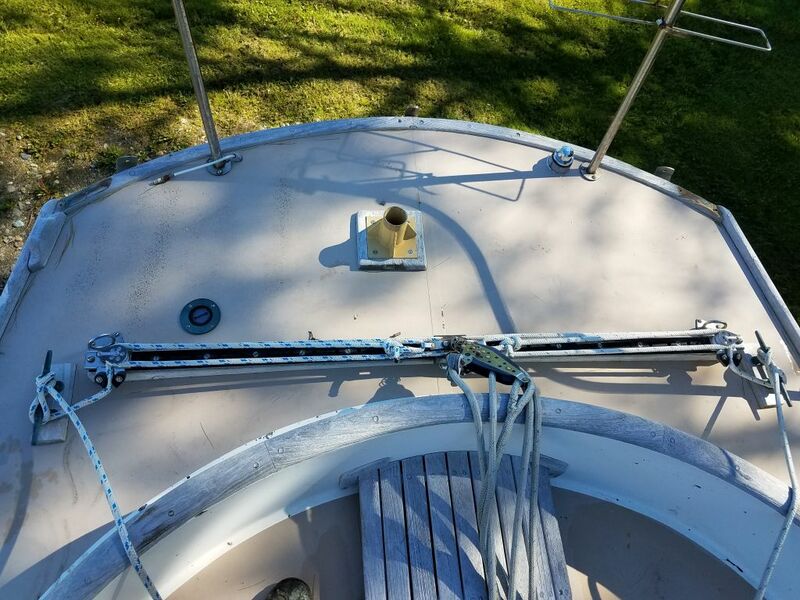 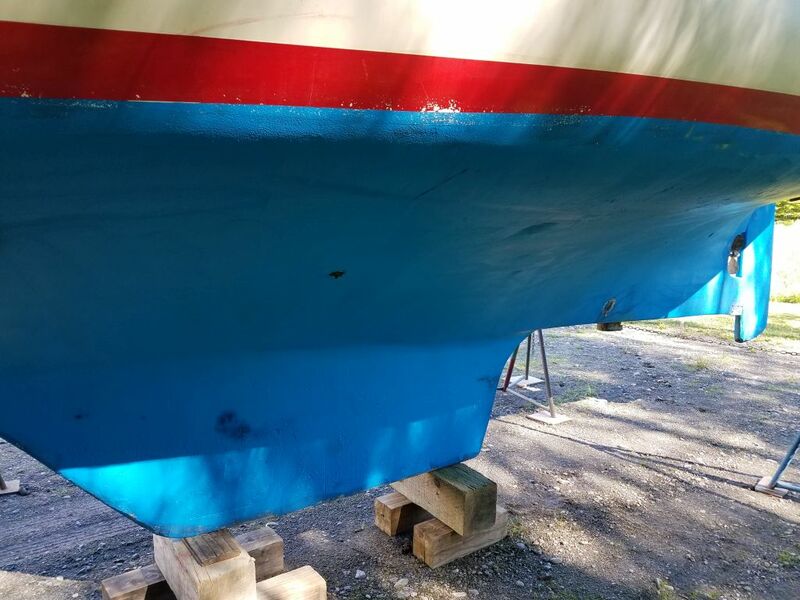 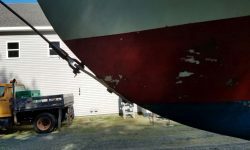 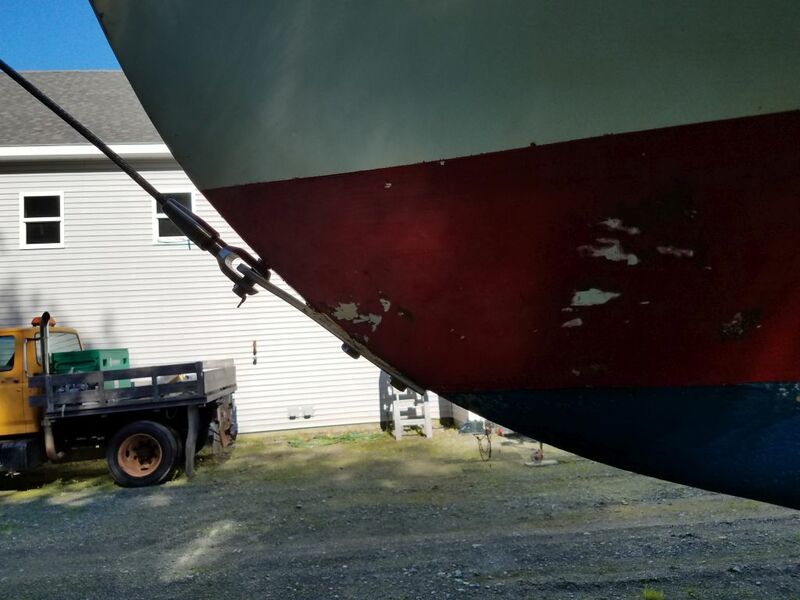 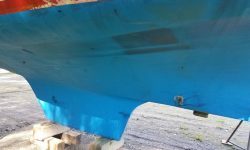 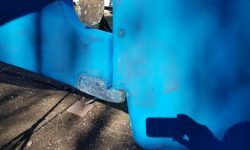 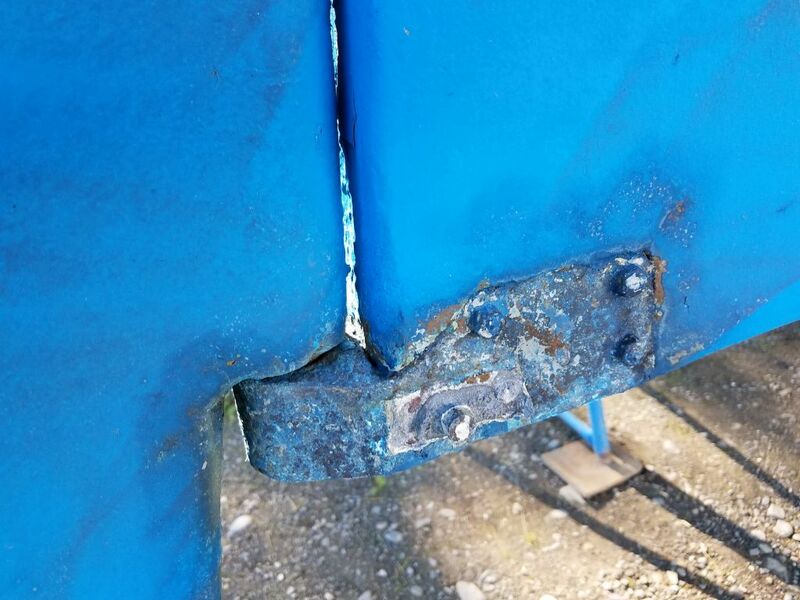 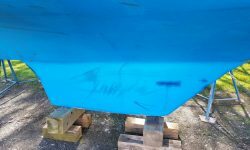 While there is substantial work required to bring the topsides back to excellent condition, it’s within normal bounds of boats of this age and nature. 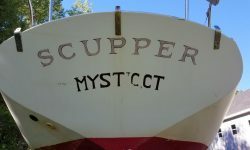 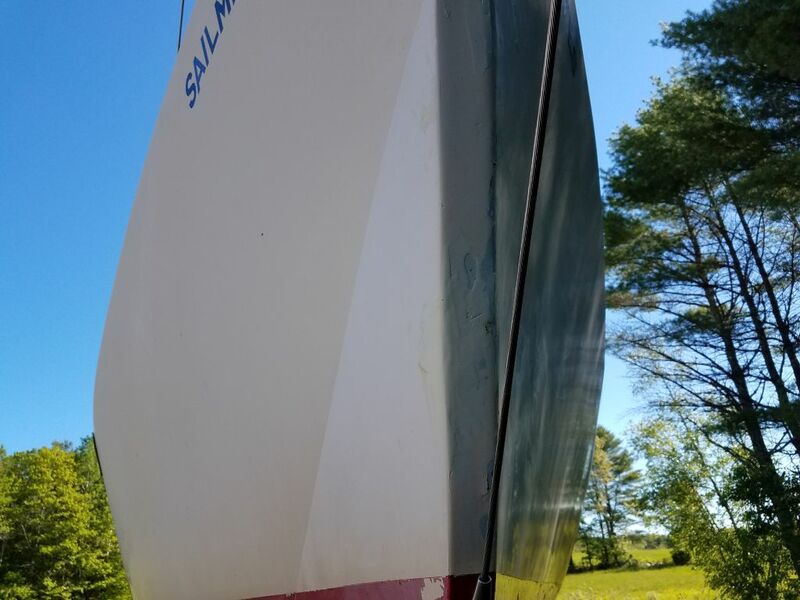 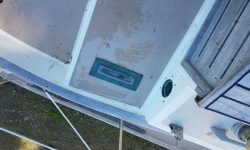 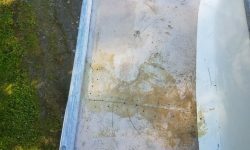 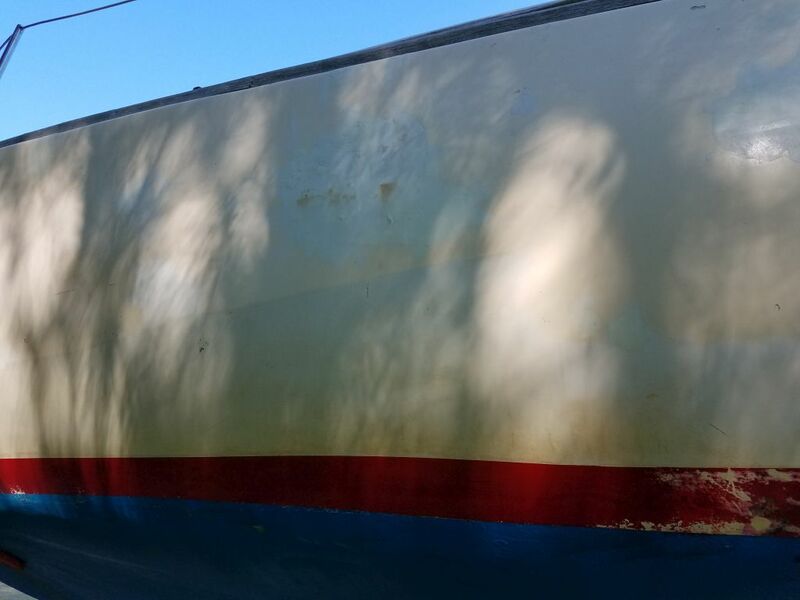 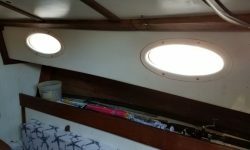 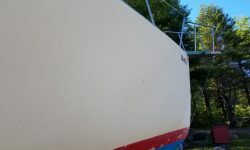 The original boottop and waterline, marked with molded scribe marks in the hull, are clearly off-kilter, in the wrong position in places, and wiggly, noticeable both by eye (in terms of overall fairness) and by the position of the floating scum line still visible. 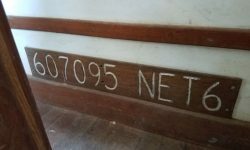 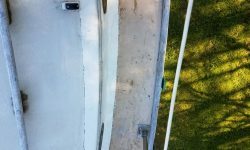 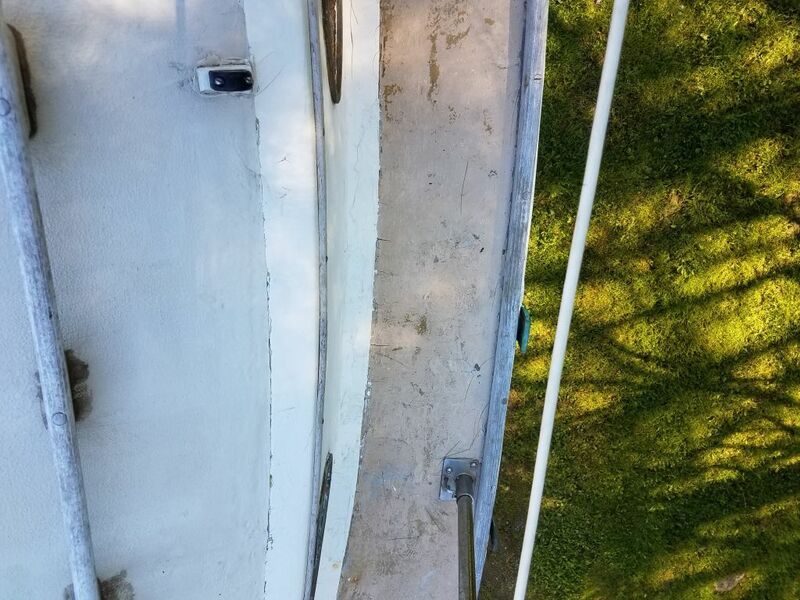 We can correct or enhance this during painting as needed. 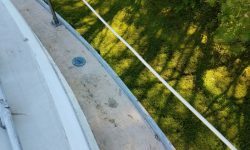 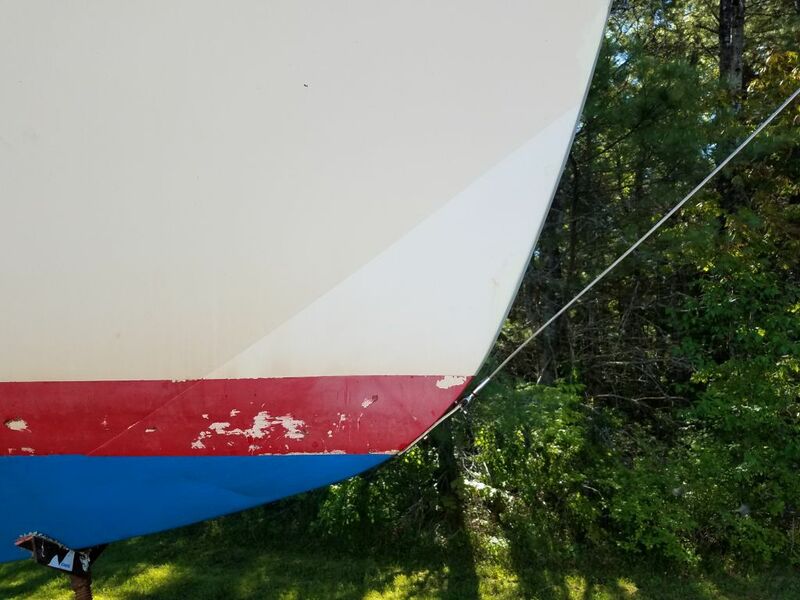 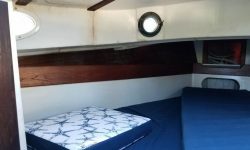 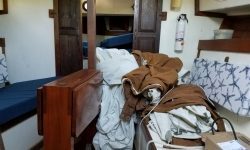 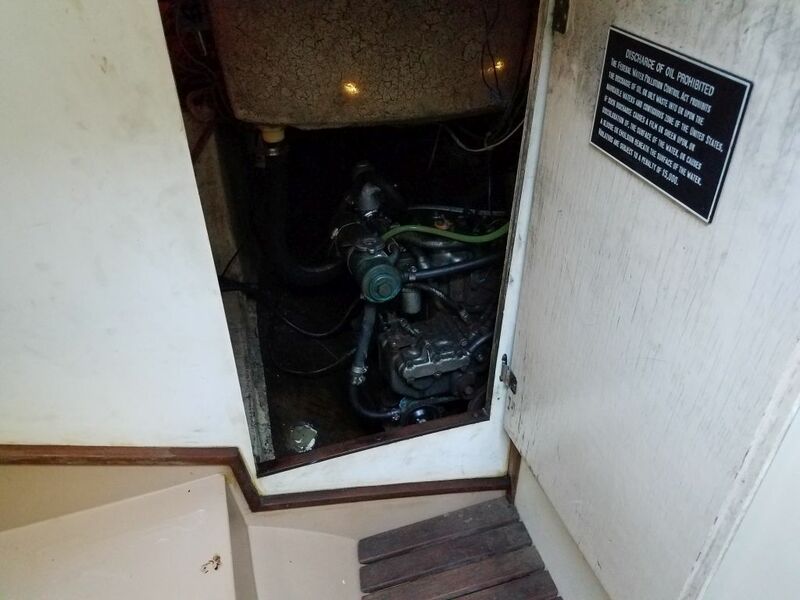 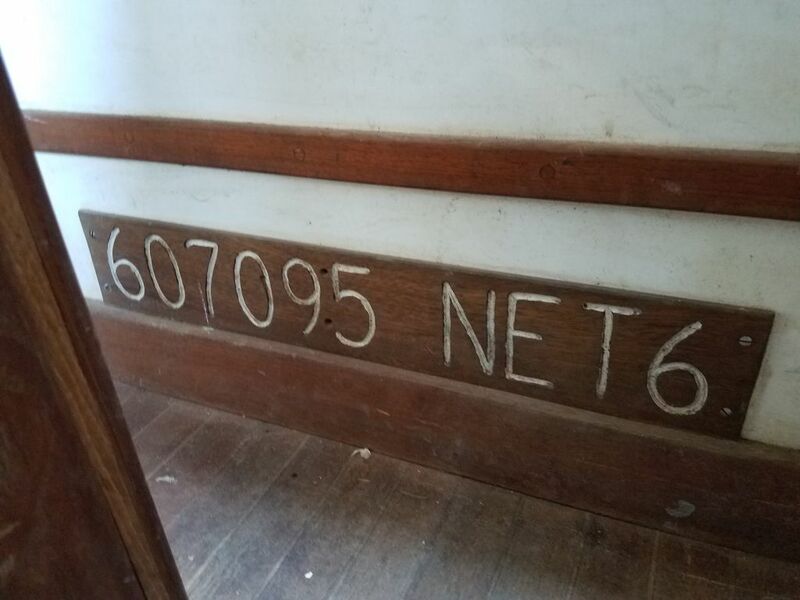 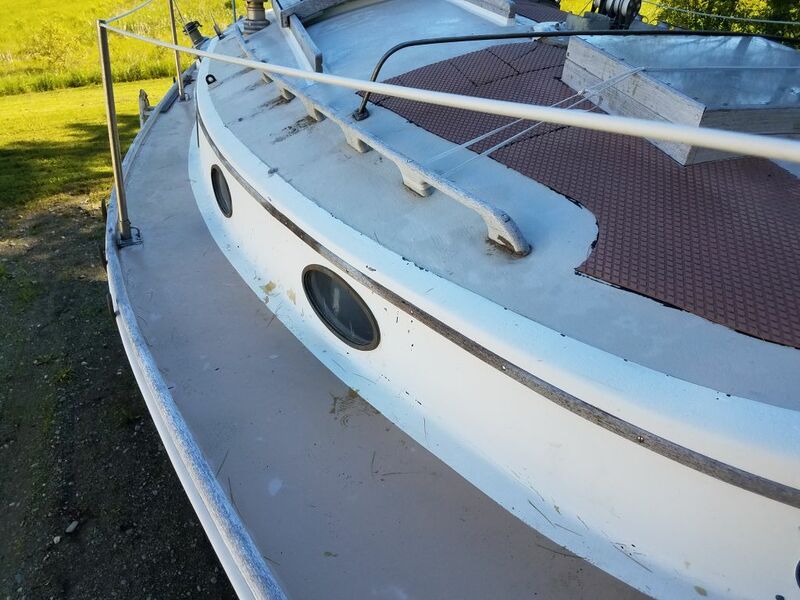 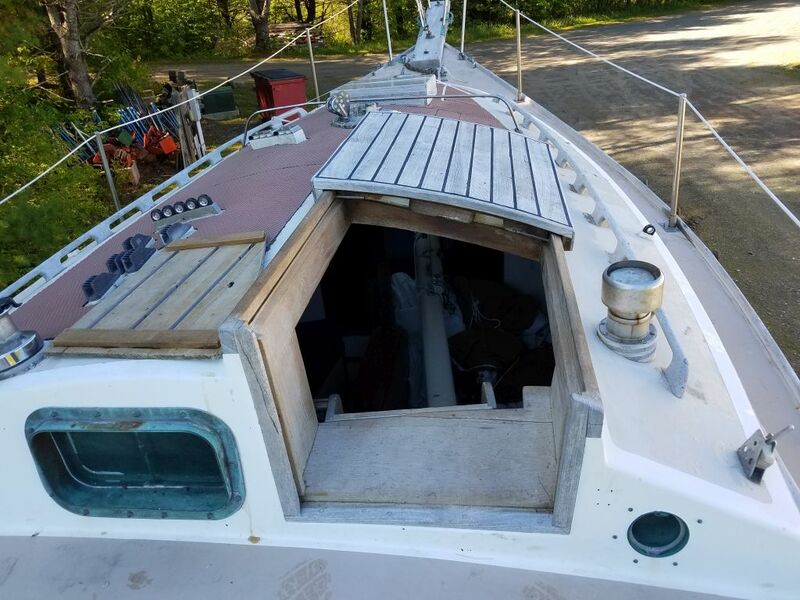 The deck is in fair to poor condition, with plenty of cosmetic restoration required in all areas (including woodwork), as well as several immediately-noticeable soft areas that will require structural repair, most notably on the bridgedeck in way of the two deck prisms. 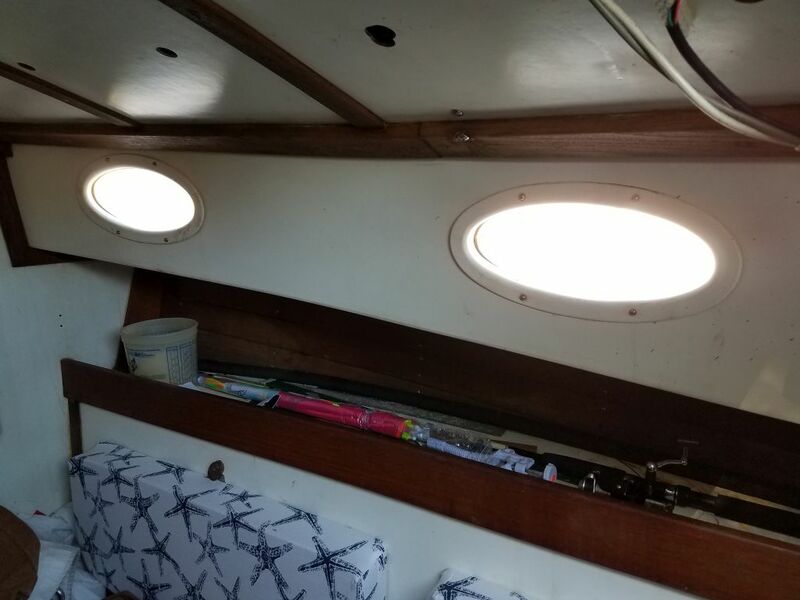 Other areas will surely come to light. 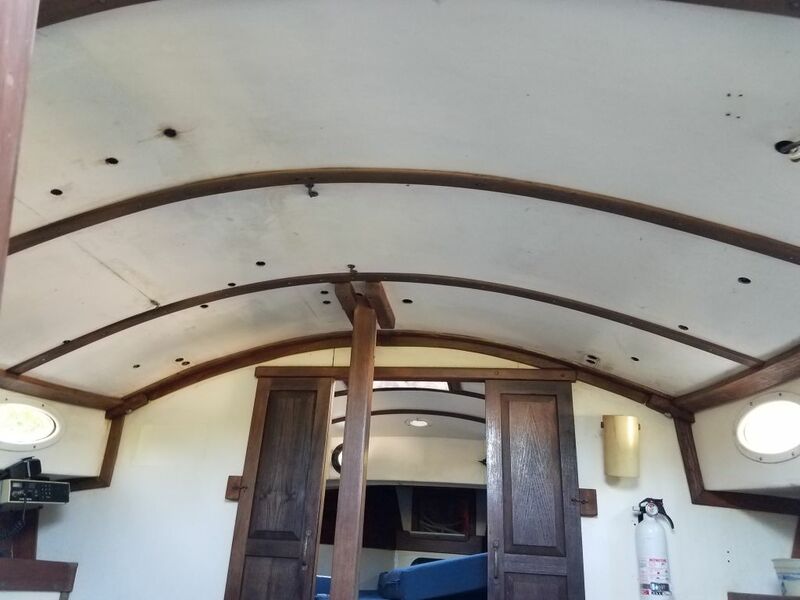 The coachroof is covered with Treadmaster applique that will require significant labor to remove during the refinishing process. 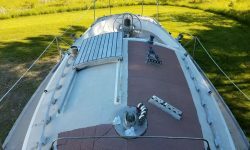 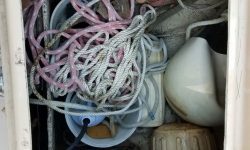 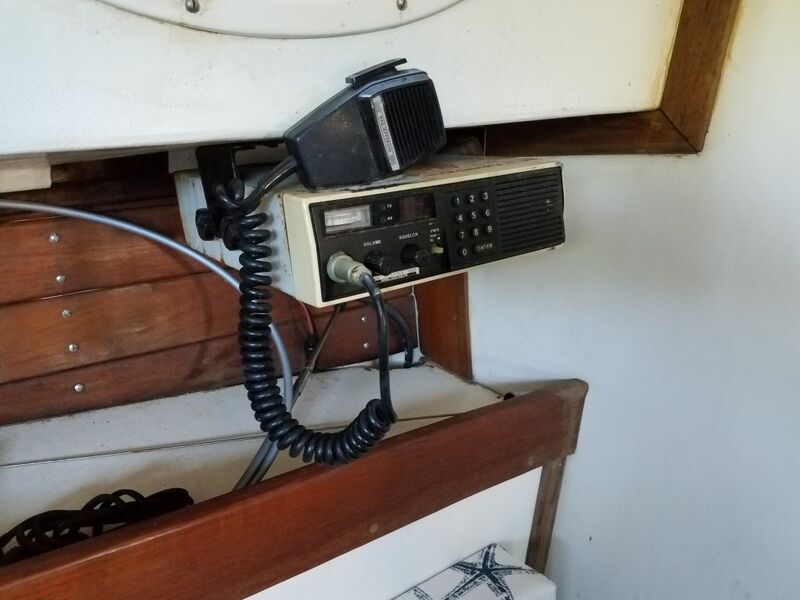 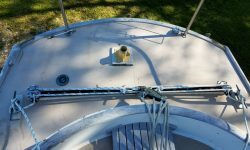 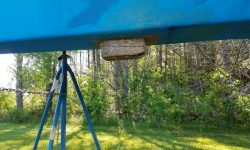 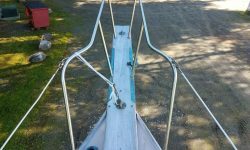 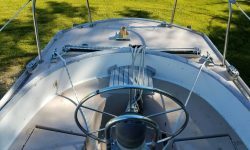 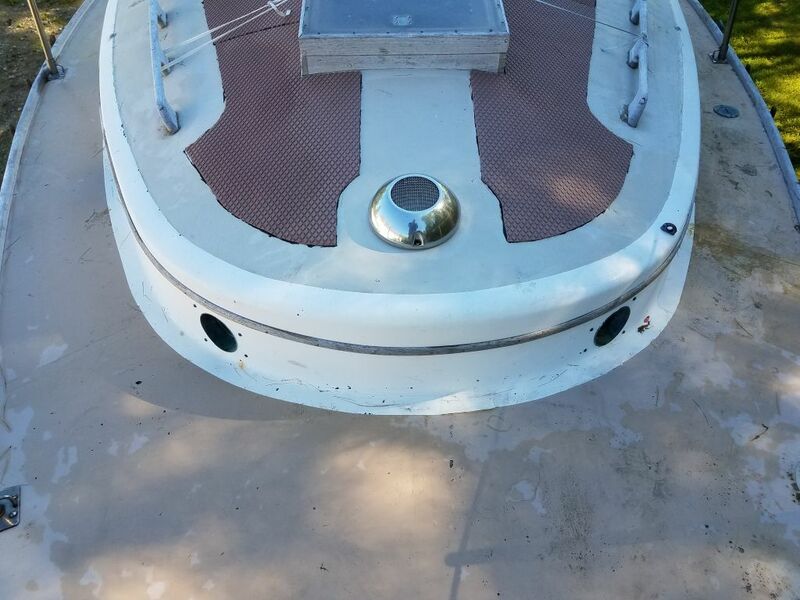 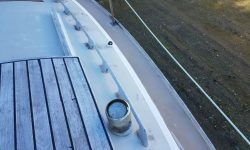 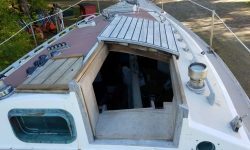 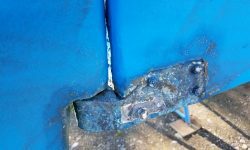 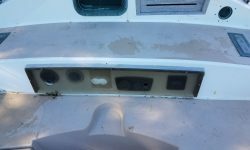 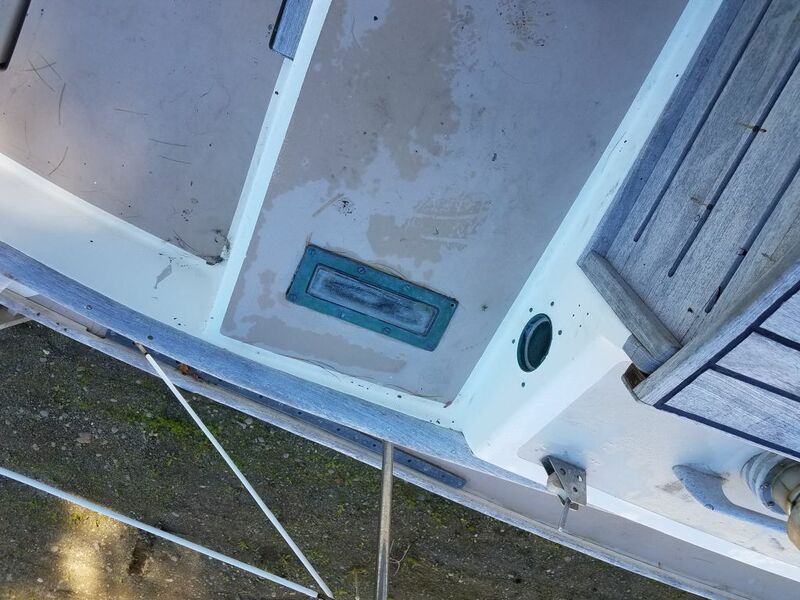 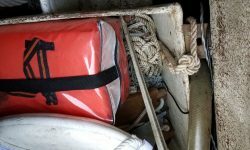 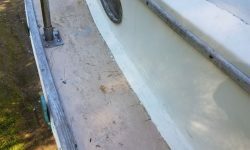 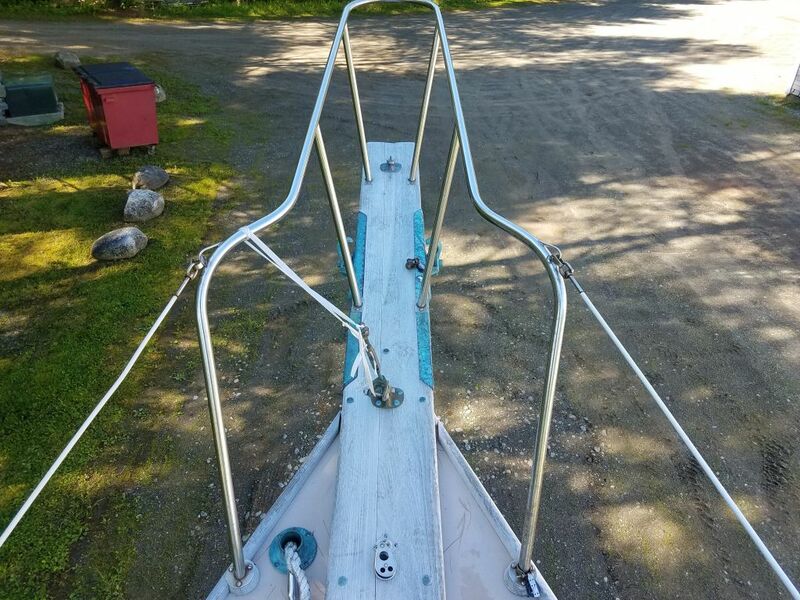 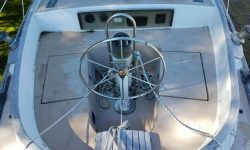 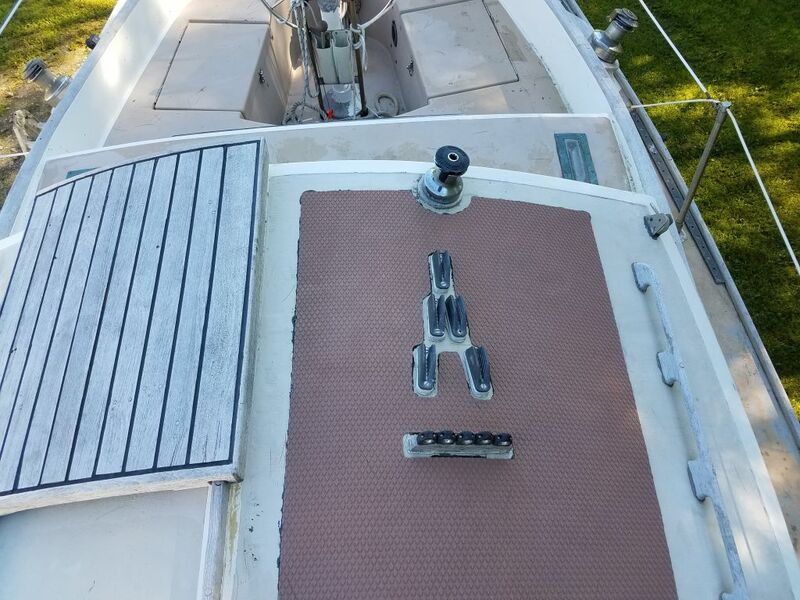 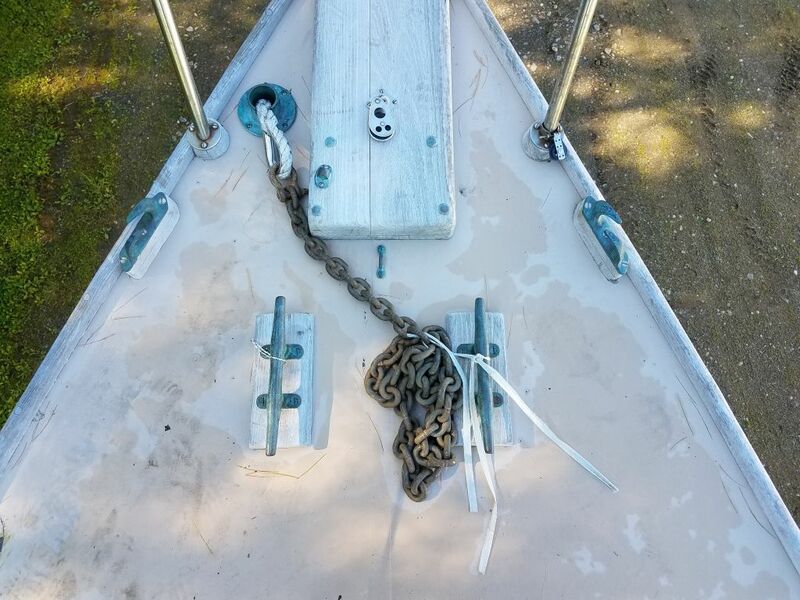 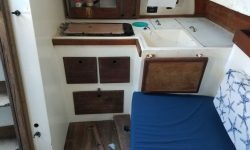 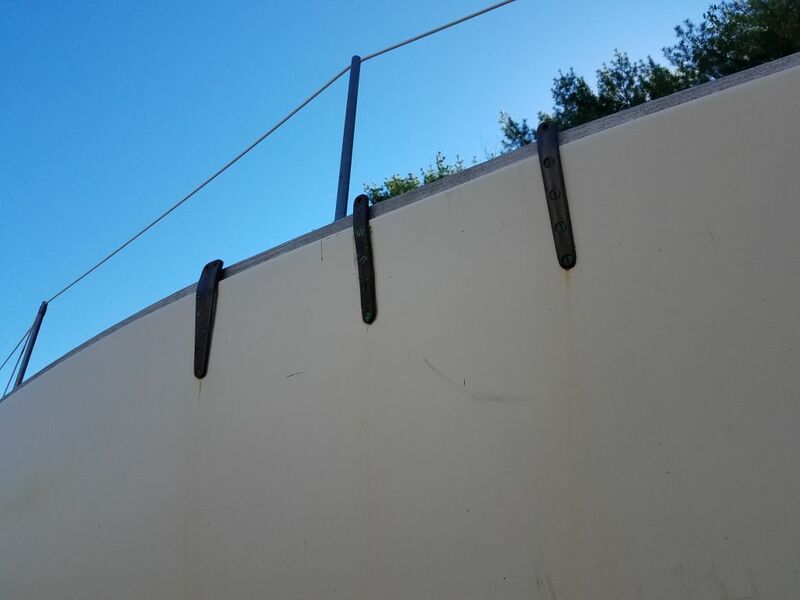 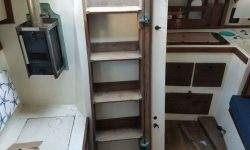 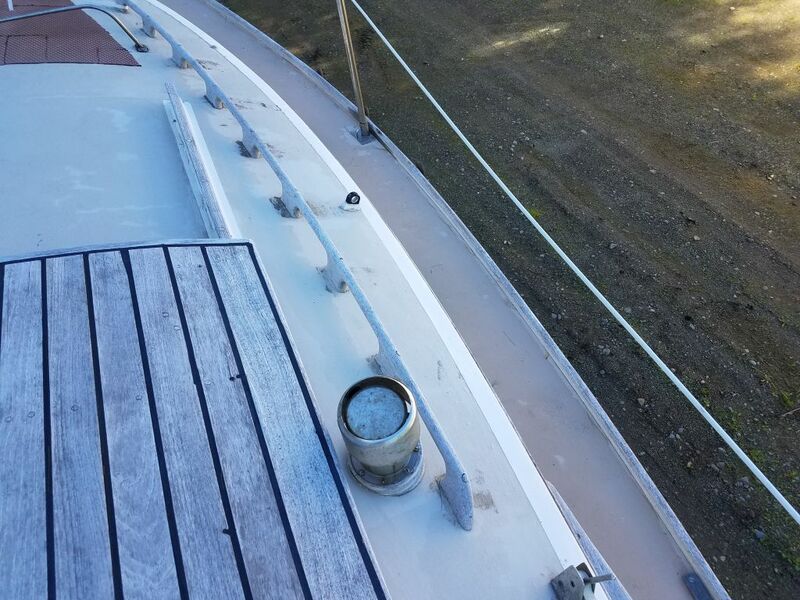 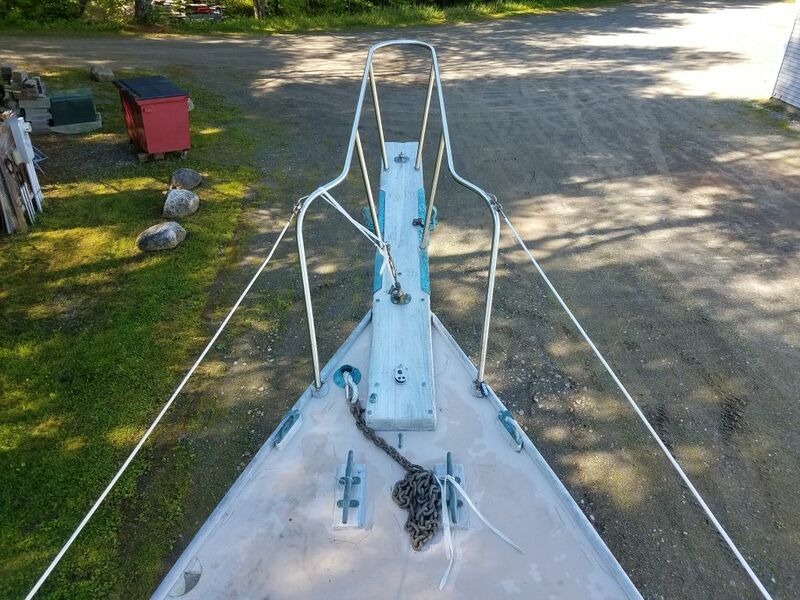 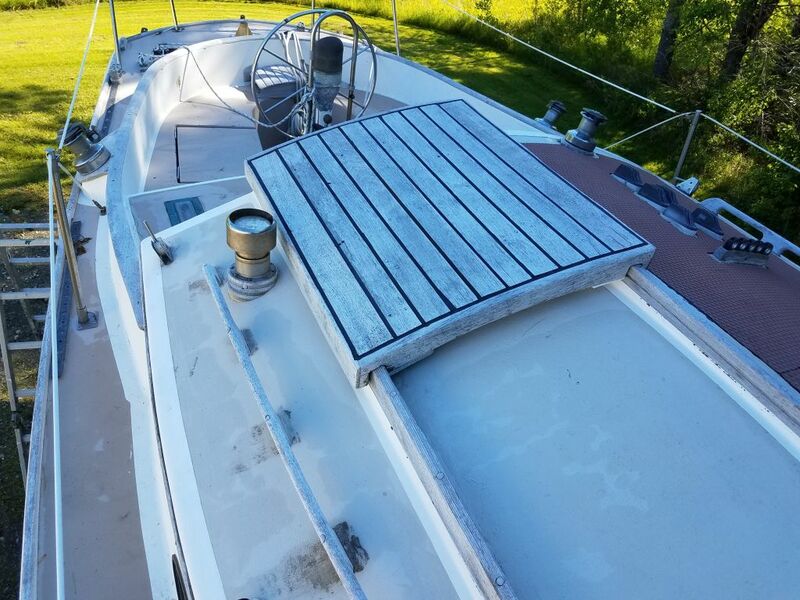 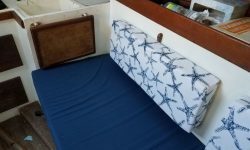 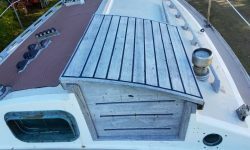 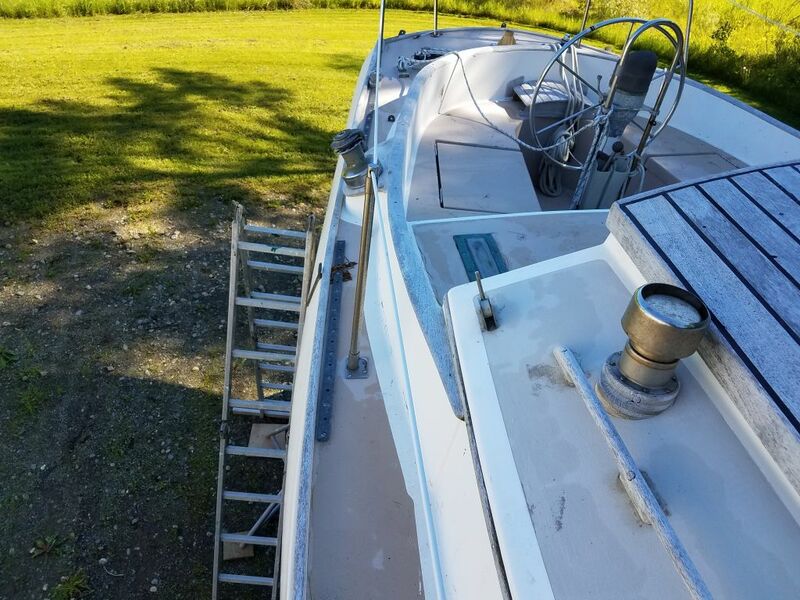 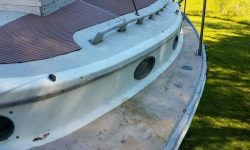 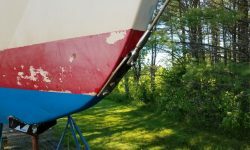 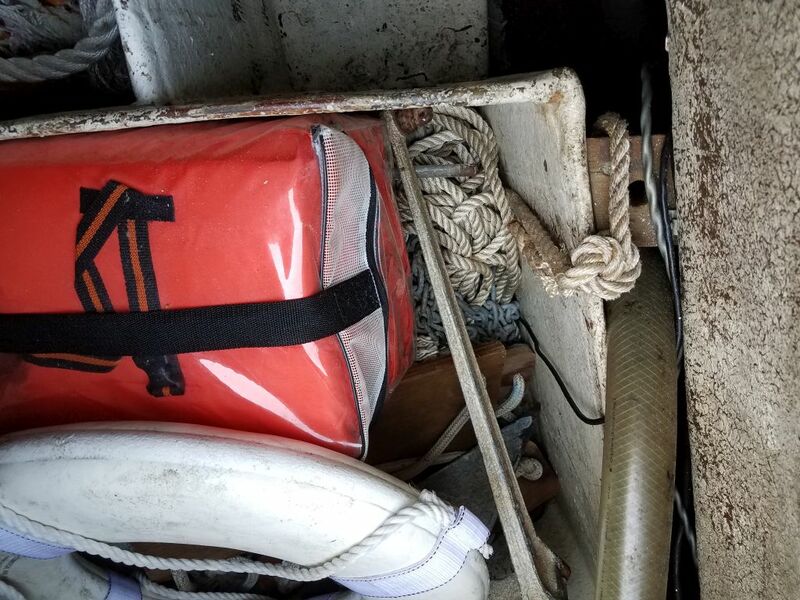 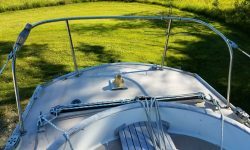 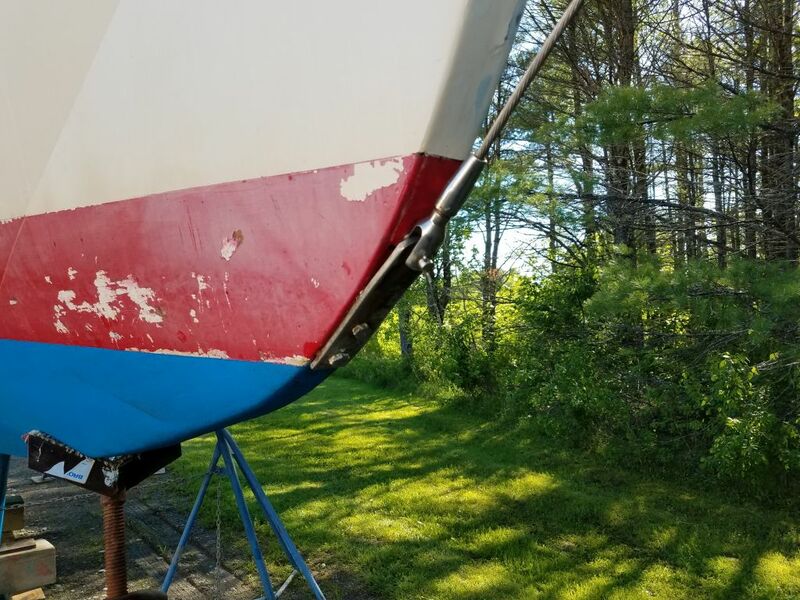 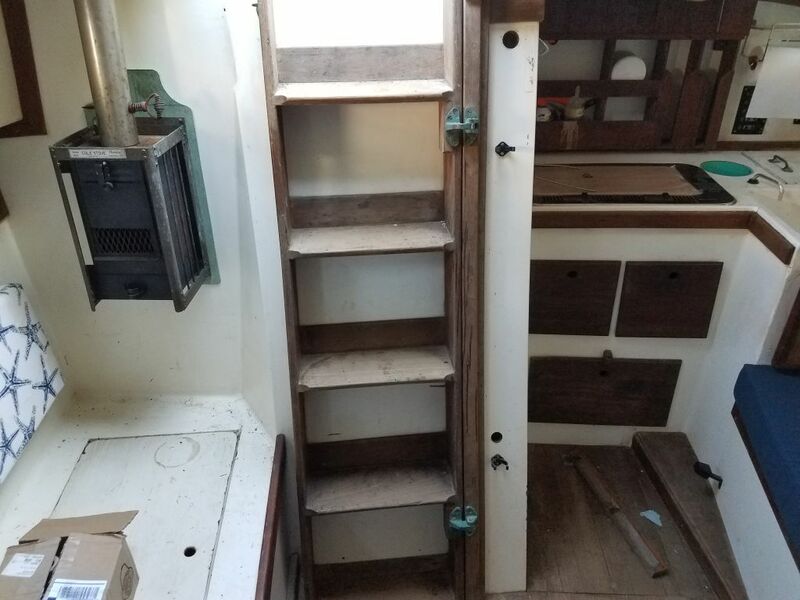 Deck hardware is of similar vintage to the boat and in various condition, mainly usable but mostly dated and in rough cosmetic condition. 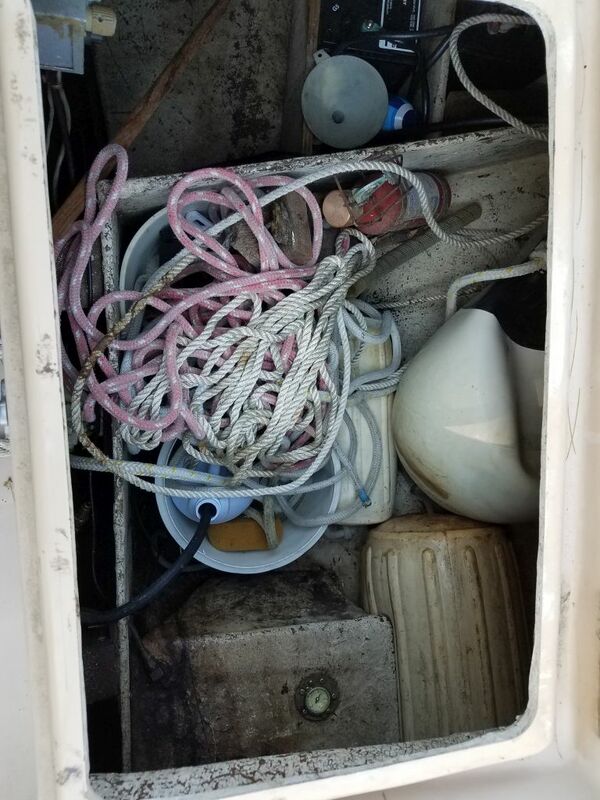 This can all be assessed later during removal. 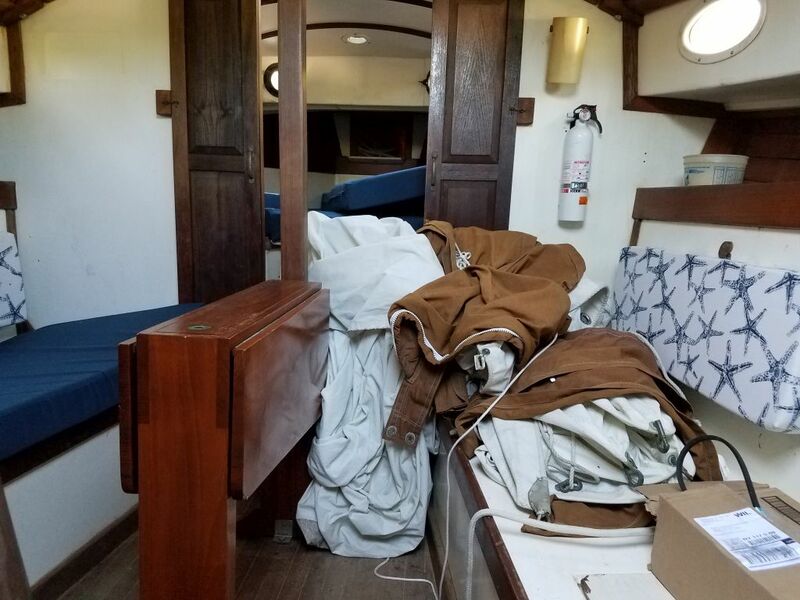 The teak bowsprit, with pulpit attached, appears sound but has some cosmetic issues. 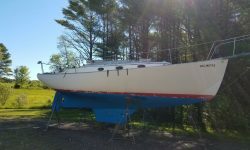 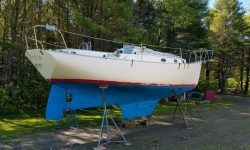 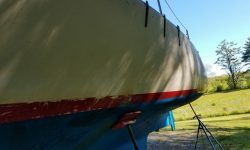 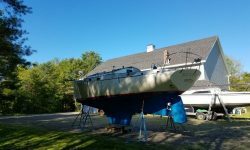 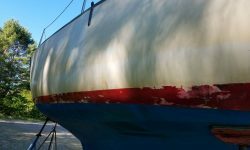 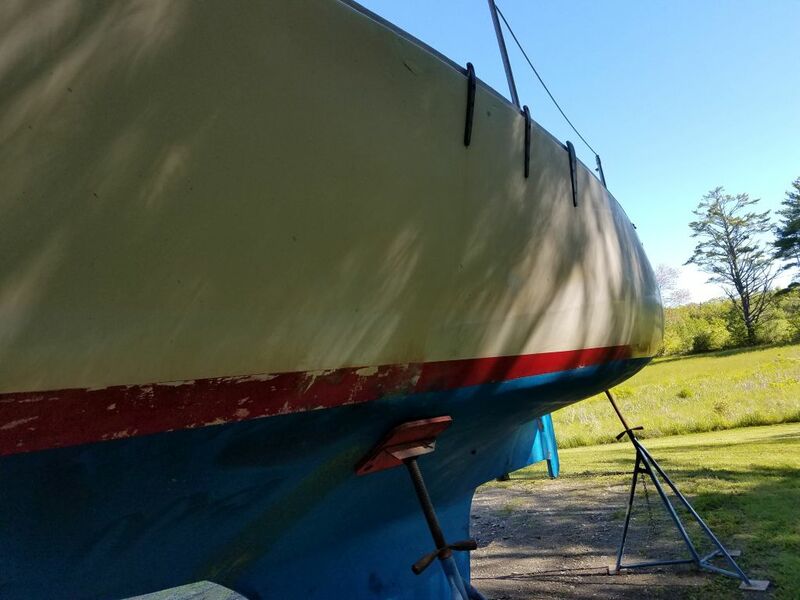 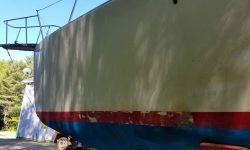 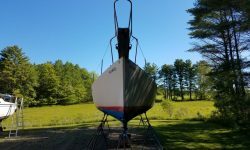 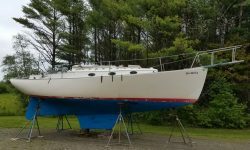 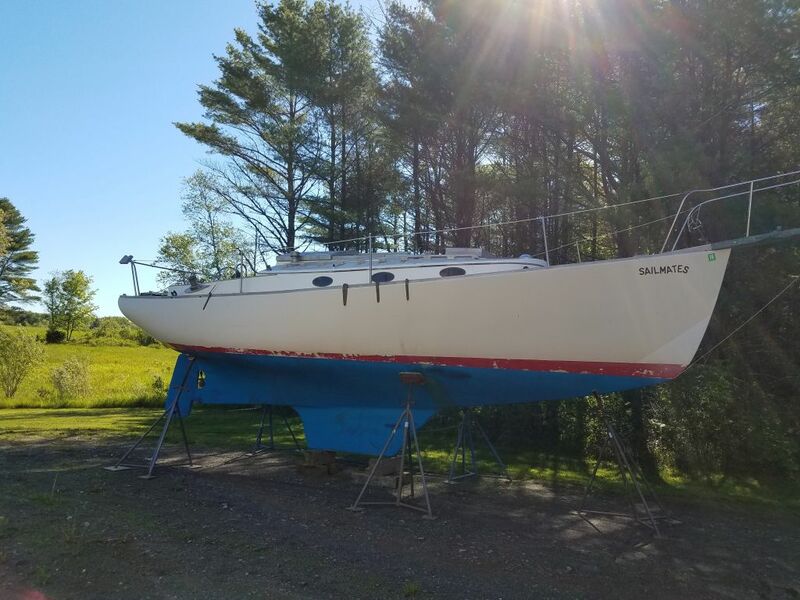 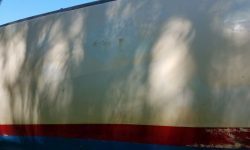 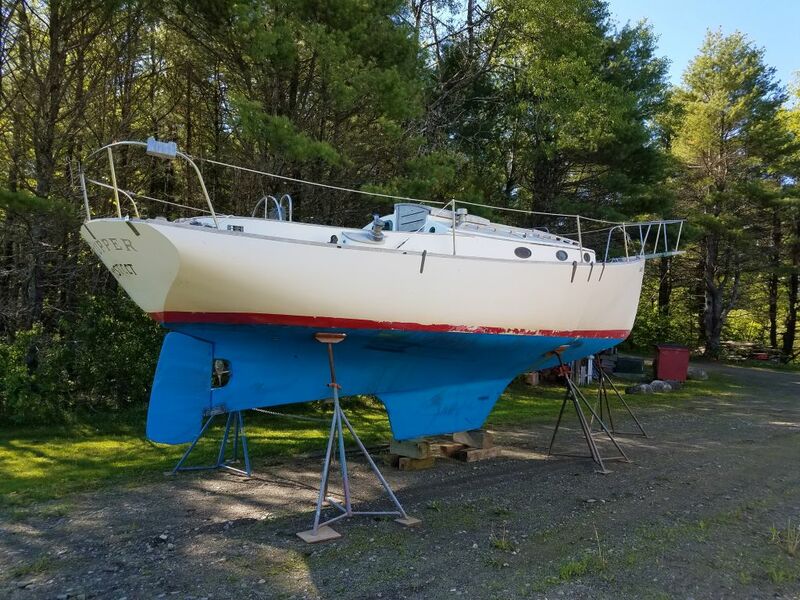 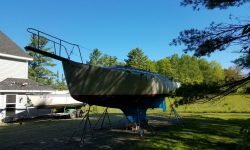 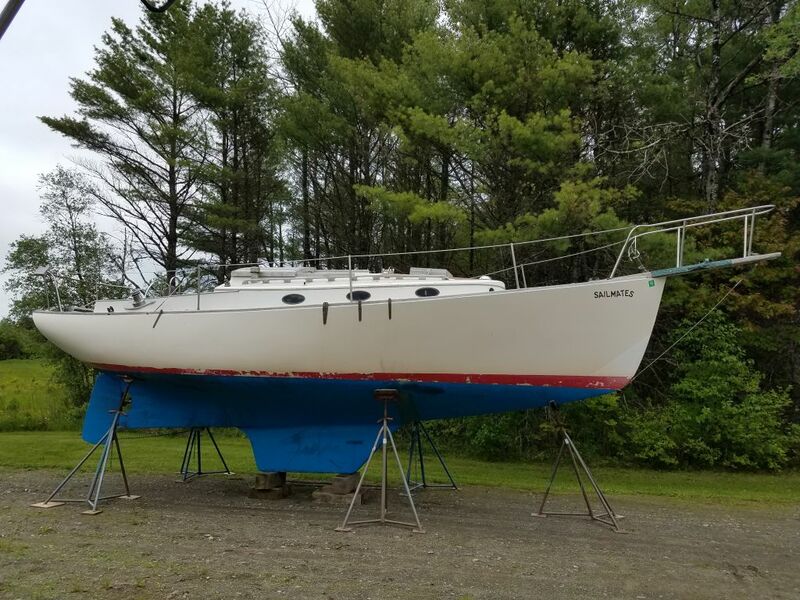 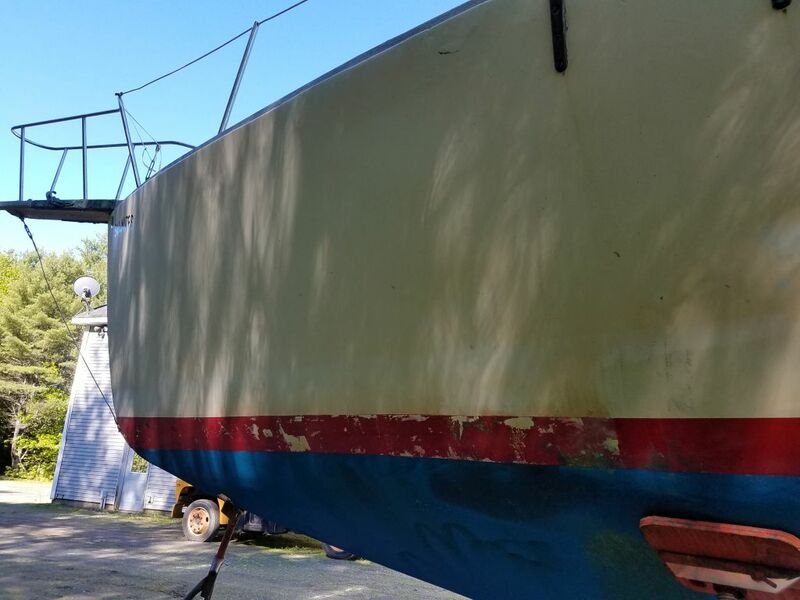 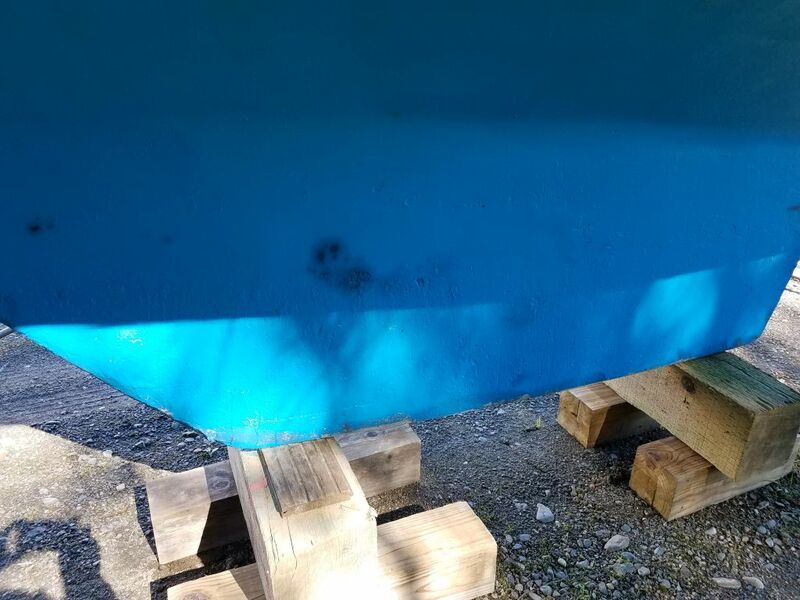 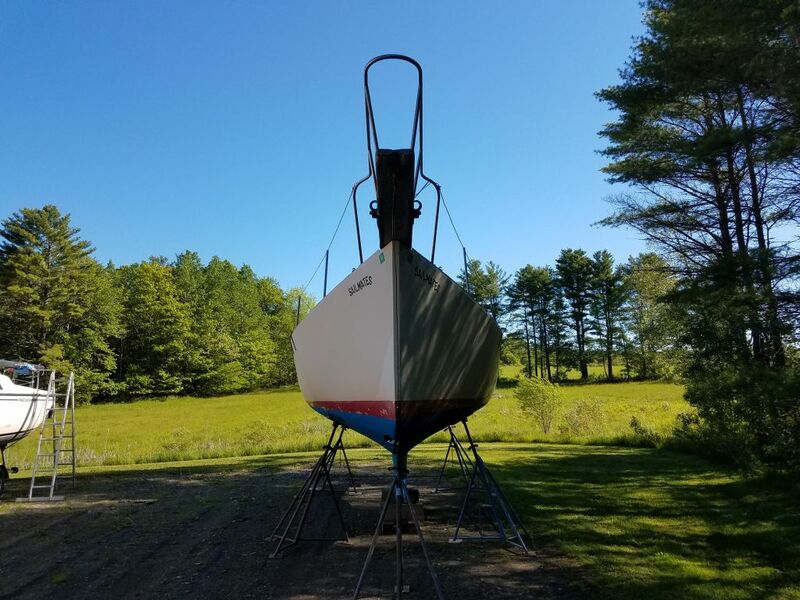 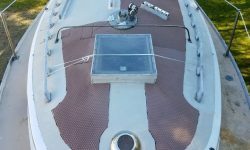 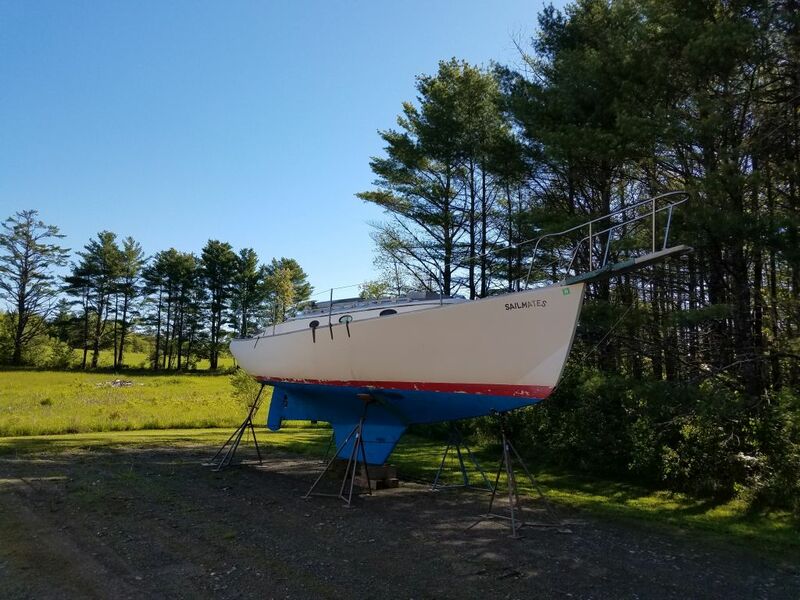 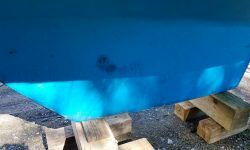 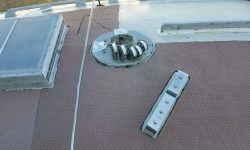 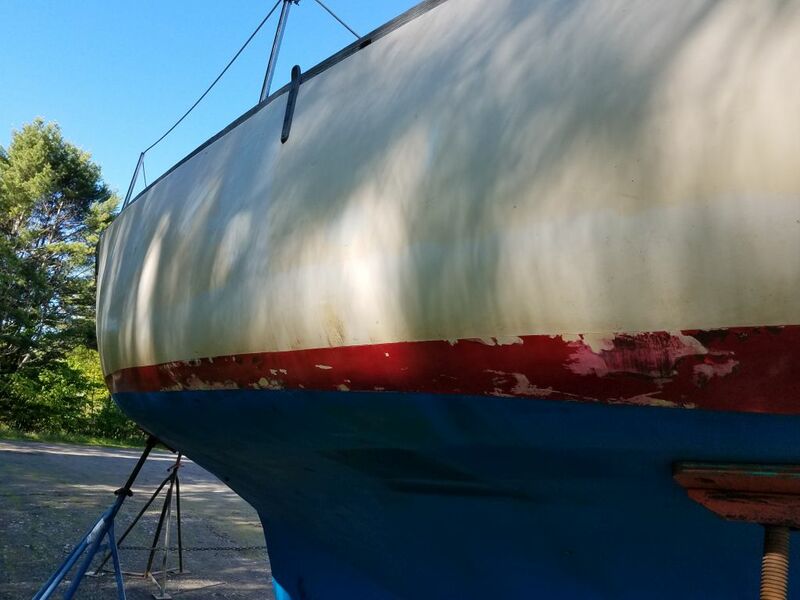 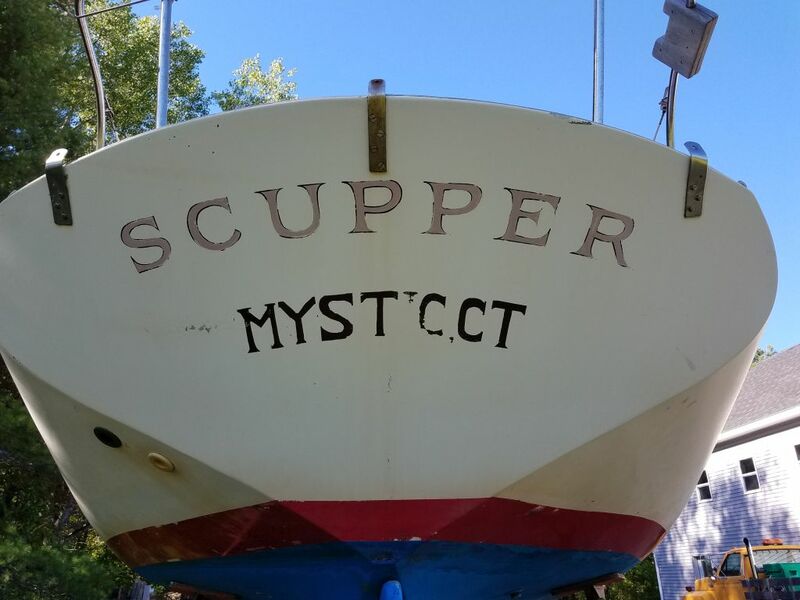 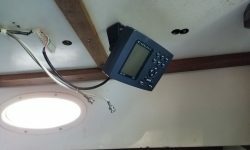 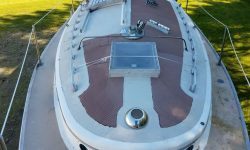 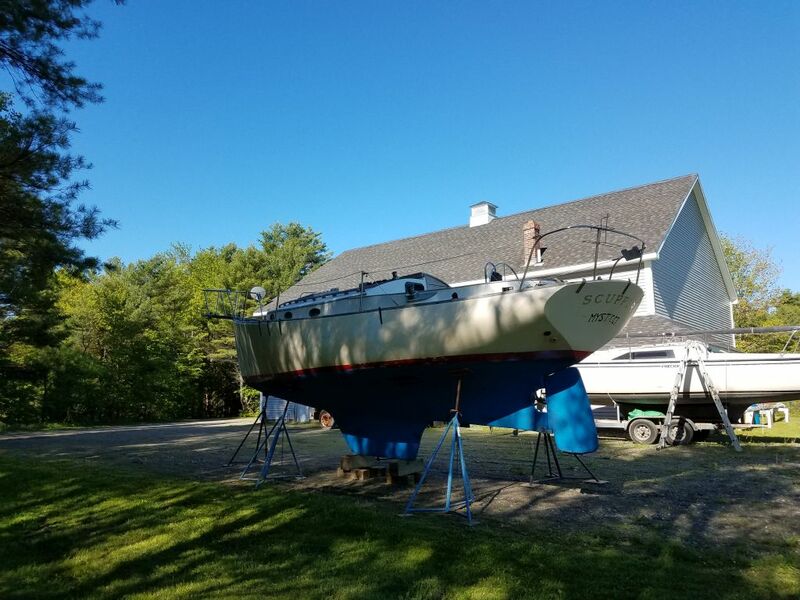 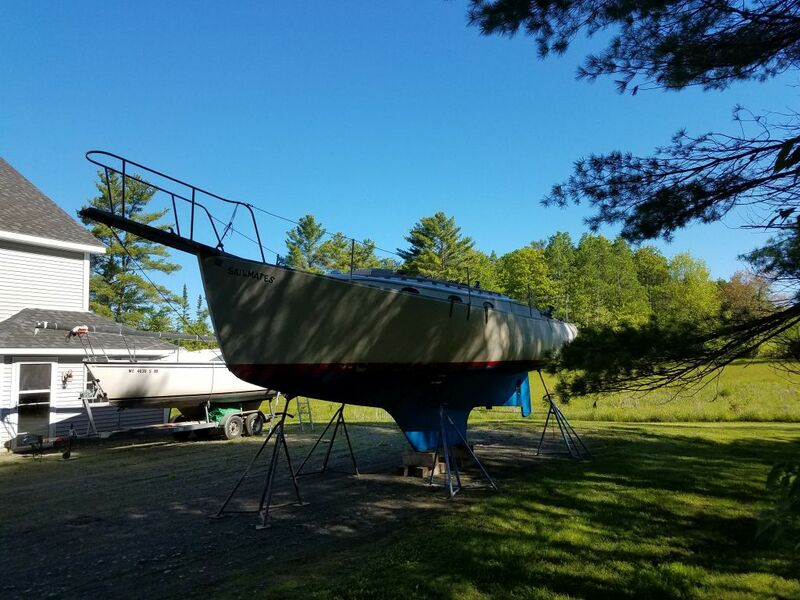 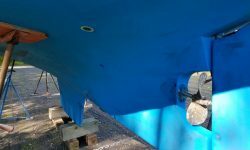 As with every part of the boat, many of the decisions related to the final scope of work will come down to personal preferences and the expectations/desires for the final condition and appearance of the boat. 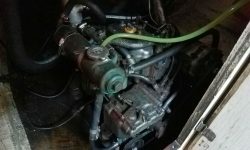 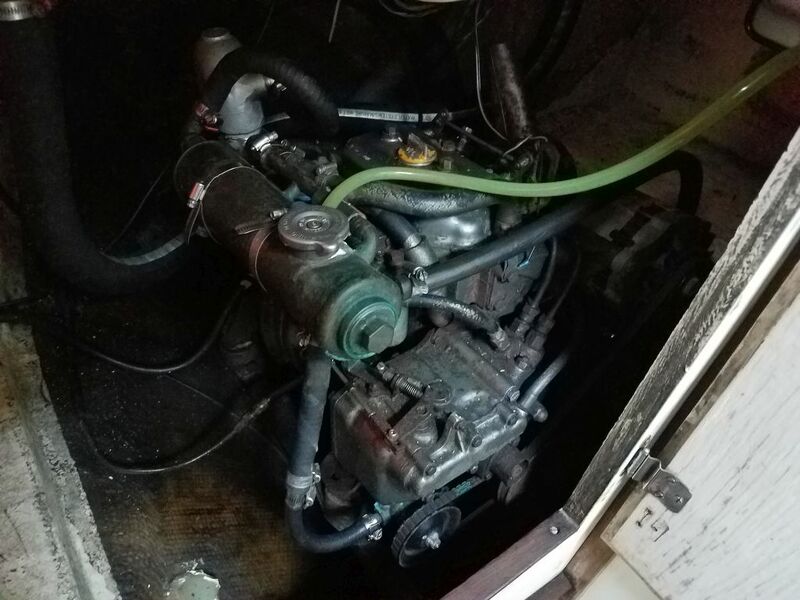 The engine, a 2-cylinder Yanmar, appears original vintage. 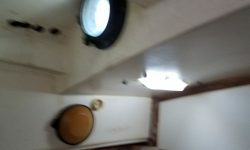 I’ve not yet assessed its true or operating condition. 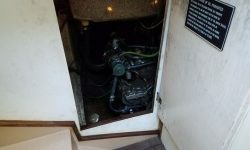 Access for general maintenance is fair; removal and/or replacement of the engine, with its location behind the head and beneath the cockpit, will require a fair expenditure of effort since there is no direct way to lift or hoist the engine. 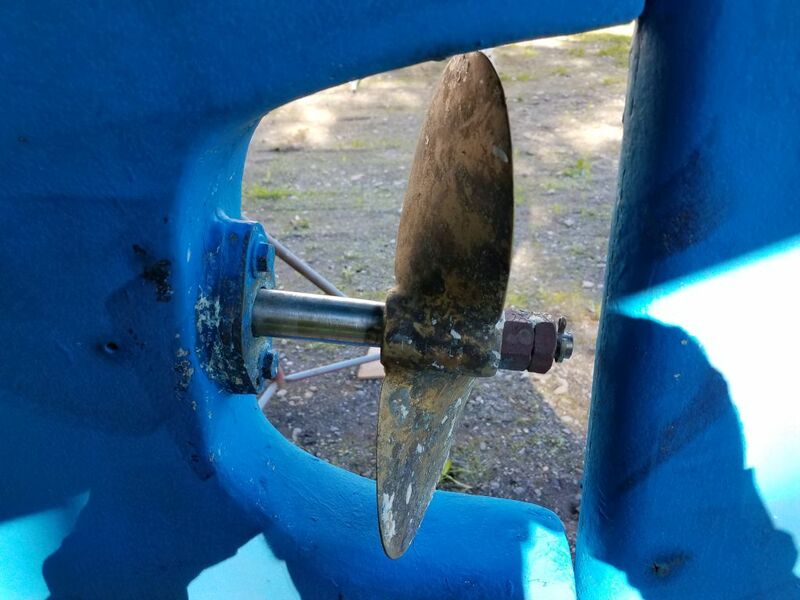 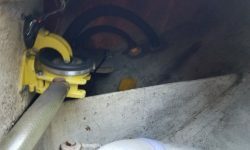 Changes to the engine may require reworking the propeller aperture to fit a different propeller. 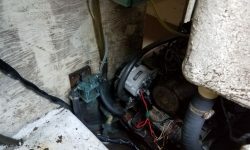 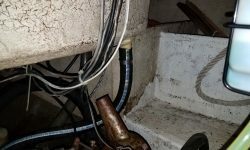 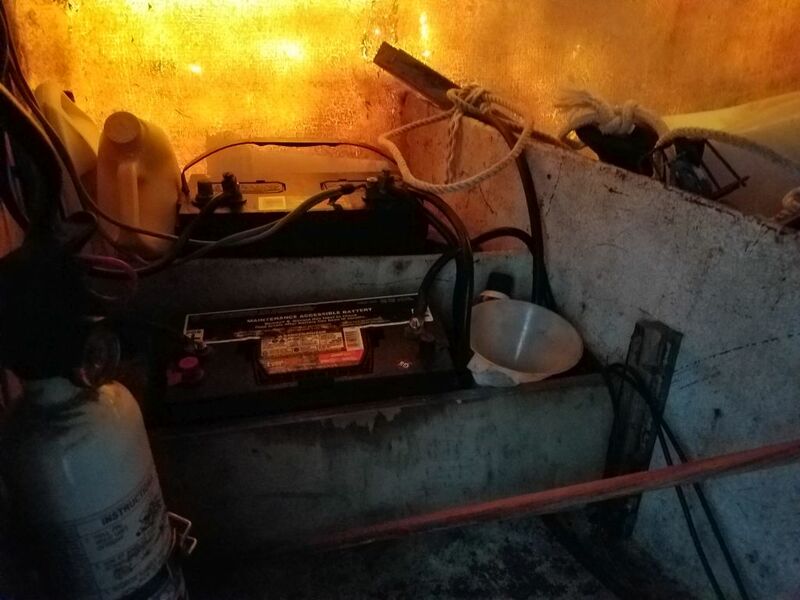 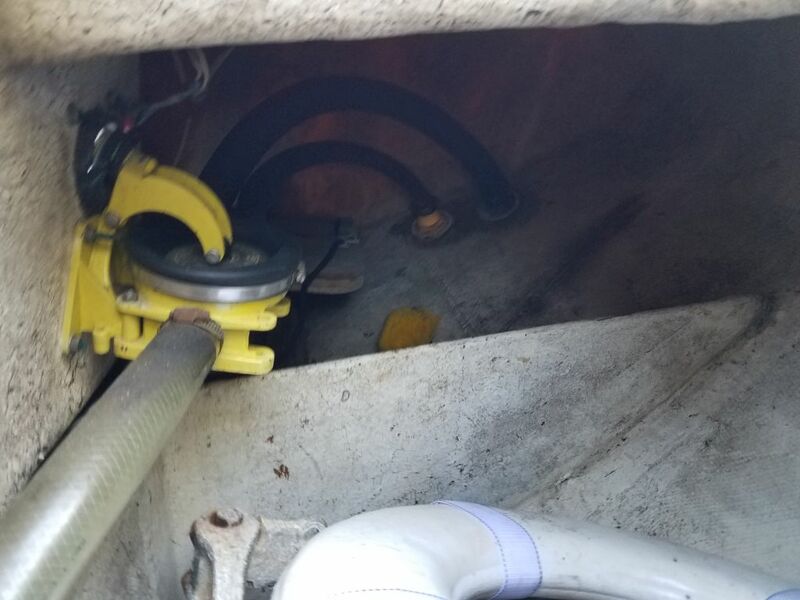 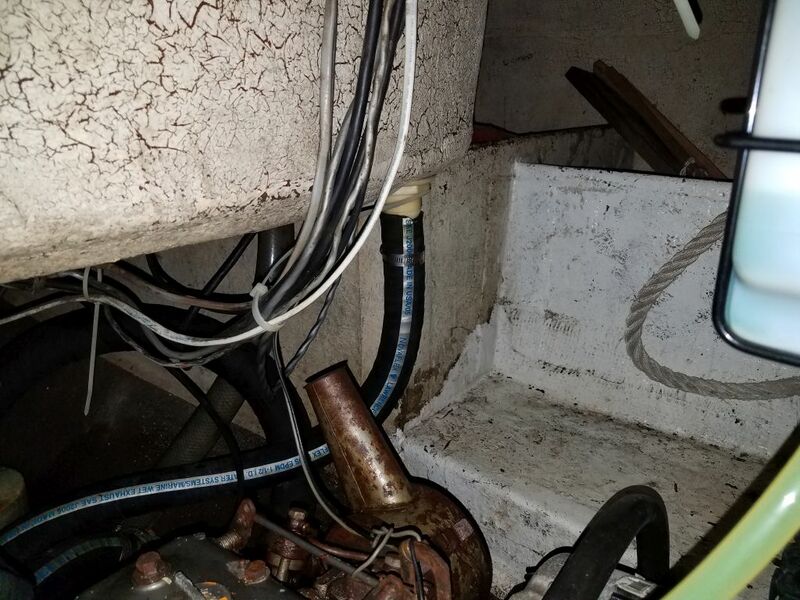 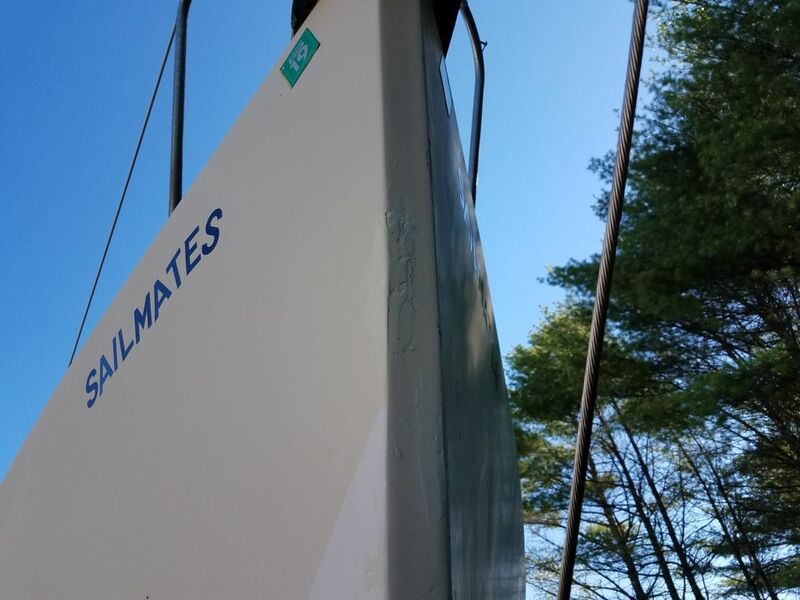 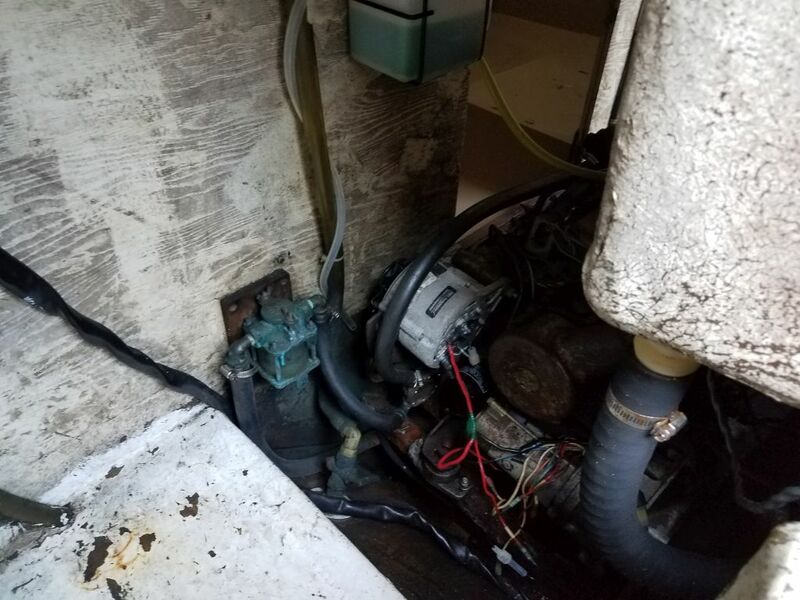 Other systems, such as plumbing, through hulls, and electrical, will require a complete and comprehensive overhaul and replacement to suit your needs and requirements. 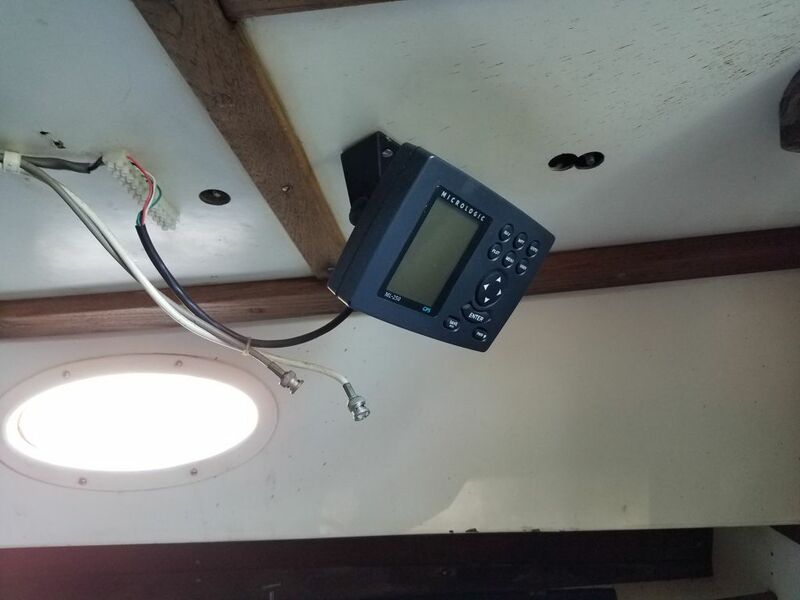 The final scope of the project in all ways will be directed largely by the extents (and installation complications) of these systems. 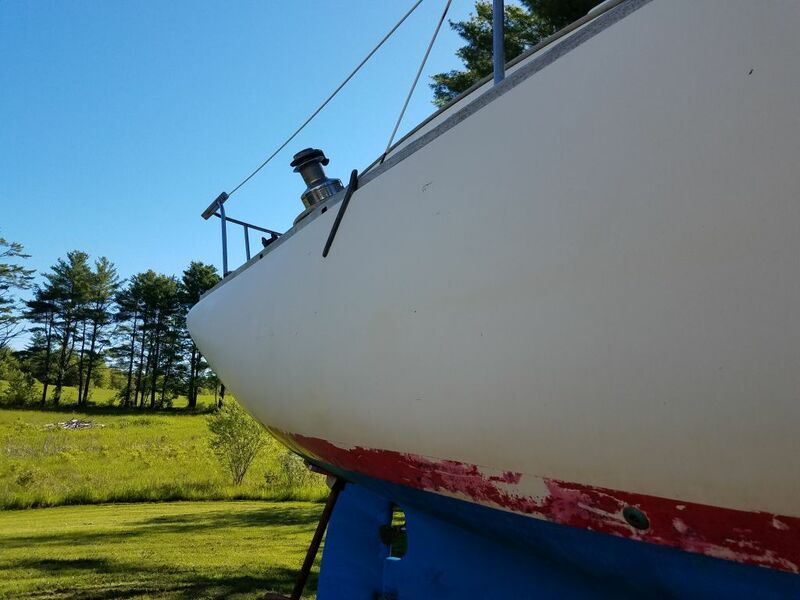 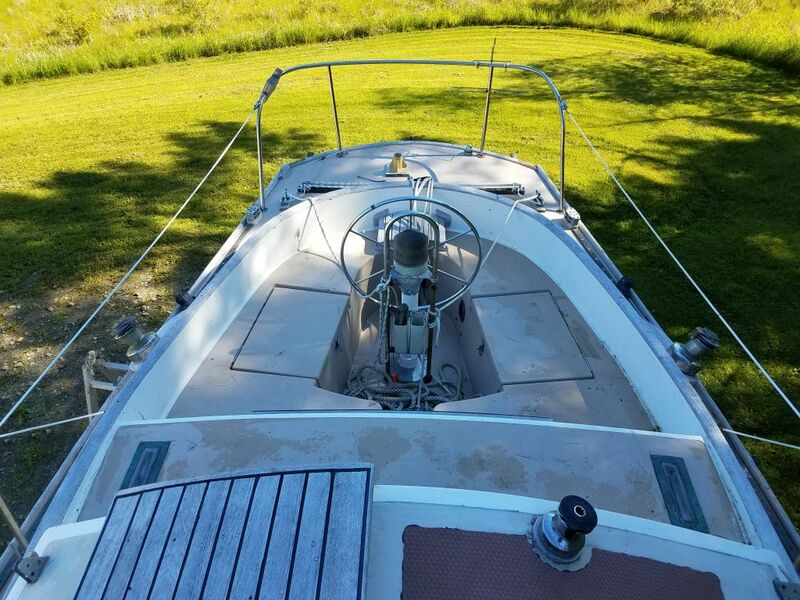 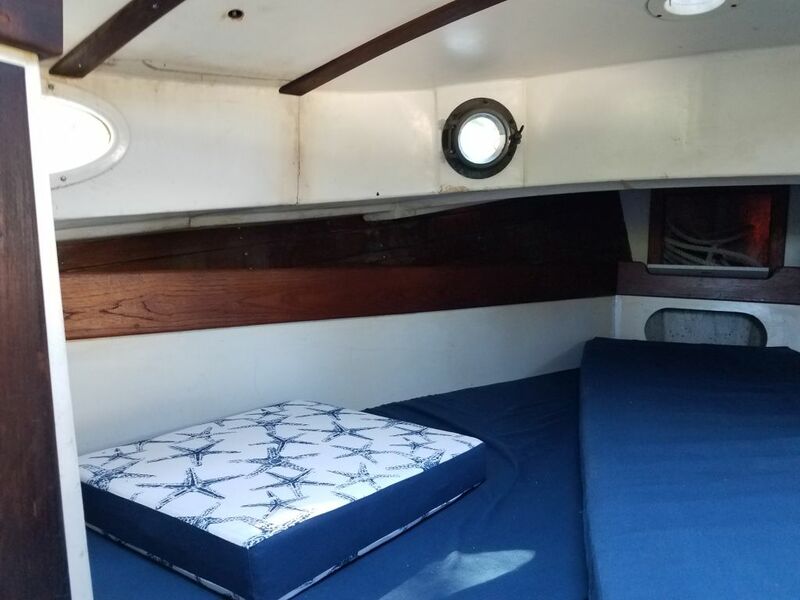 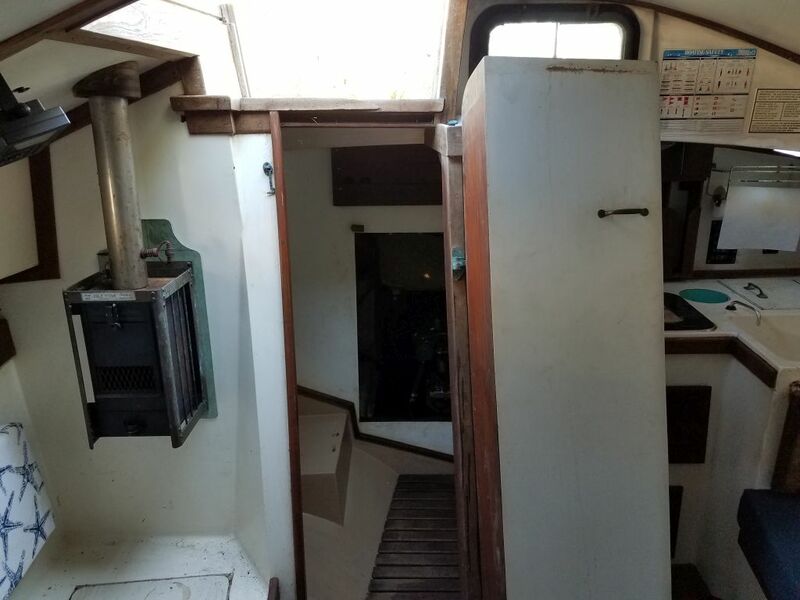 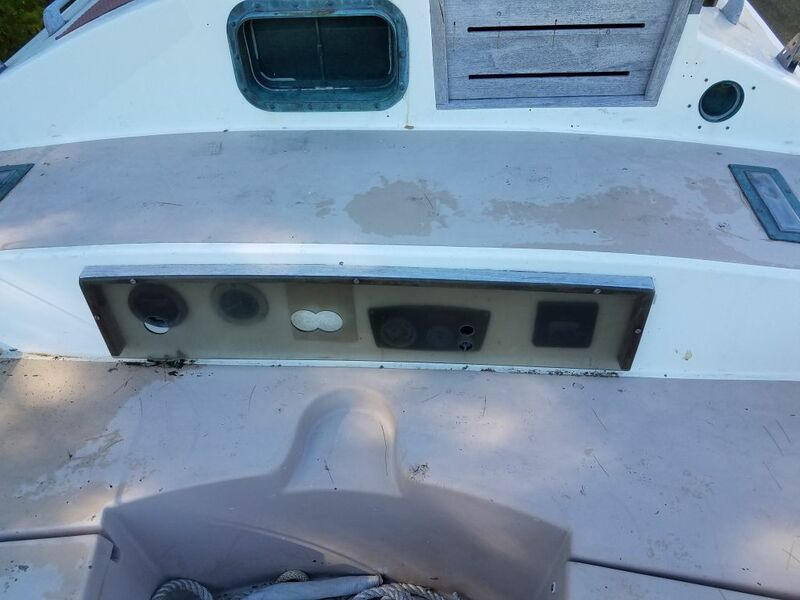 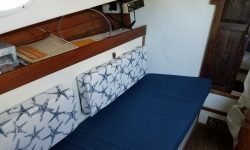 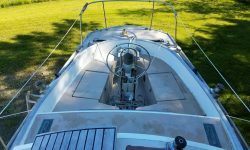 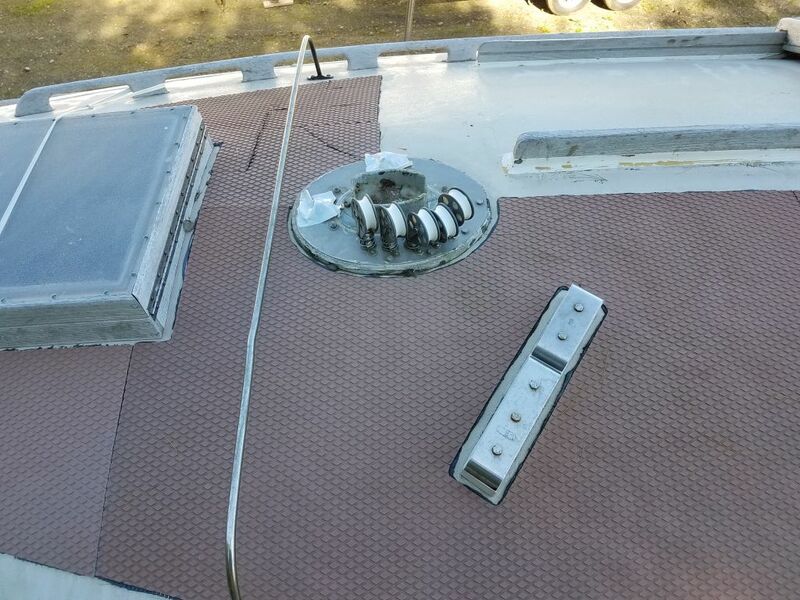 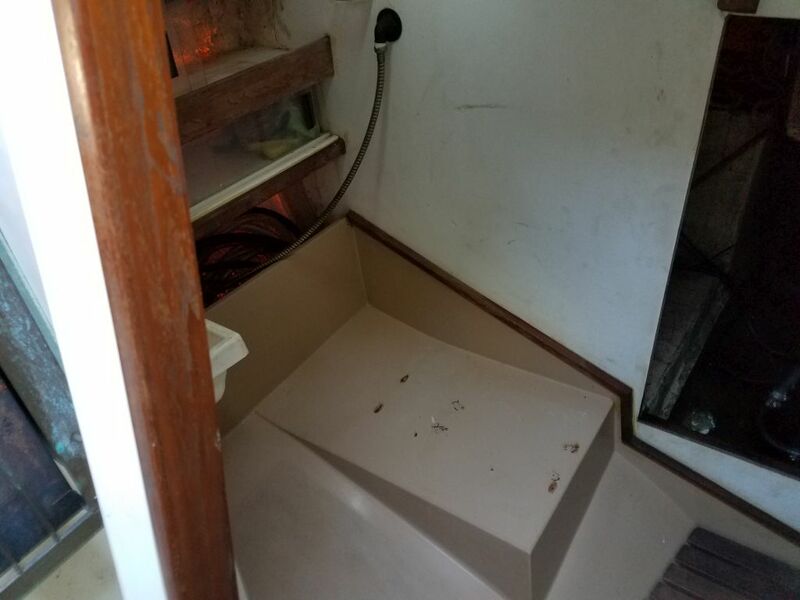 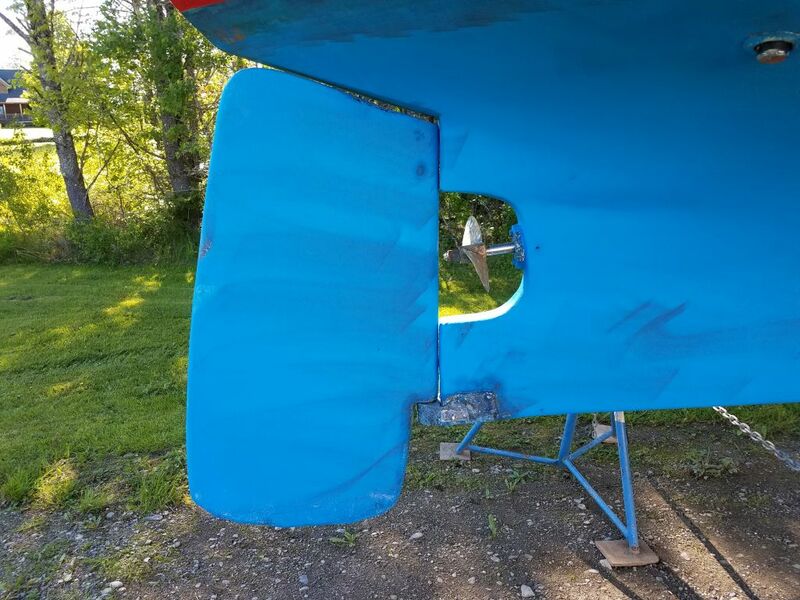 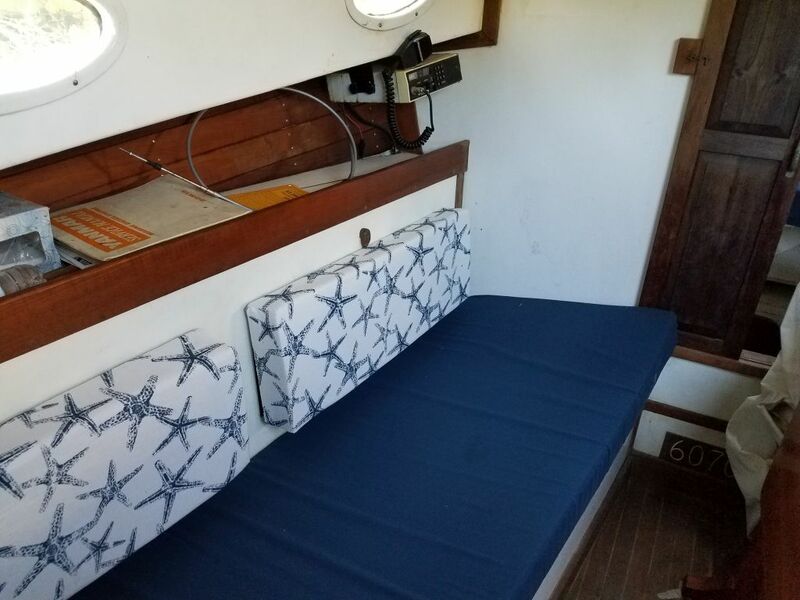 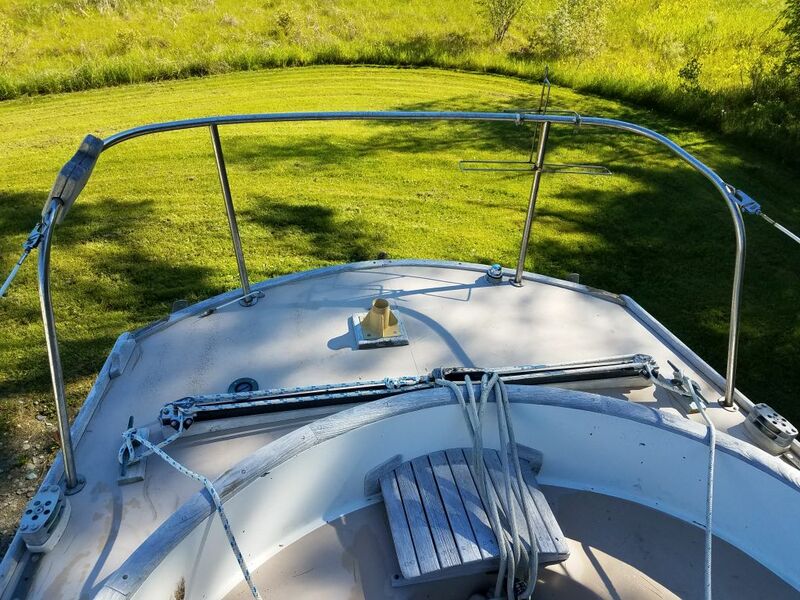 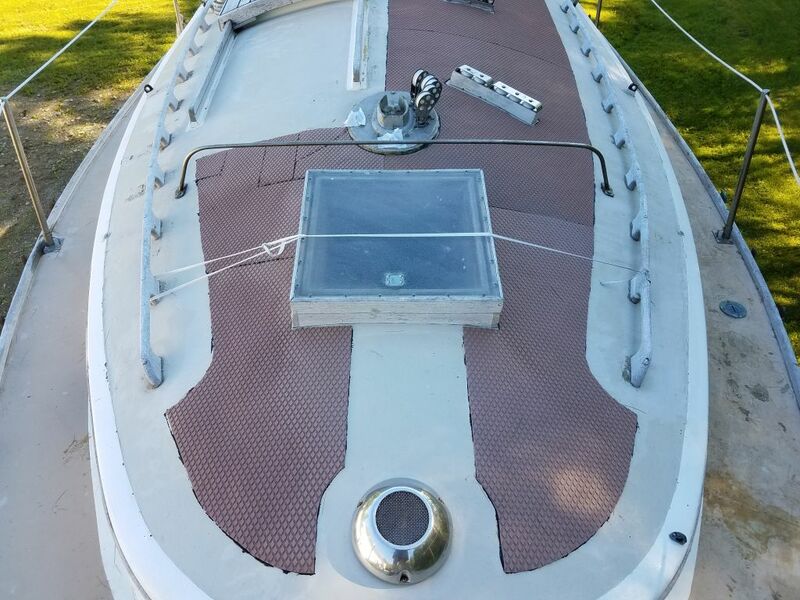 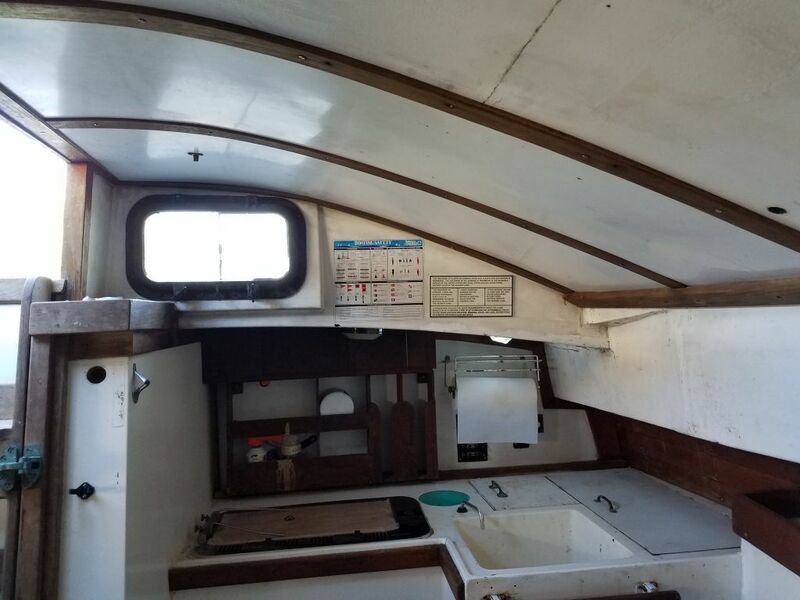 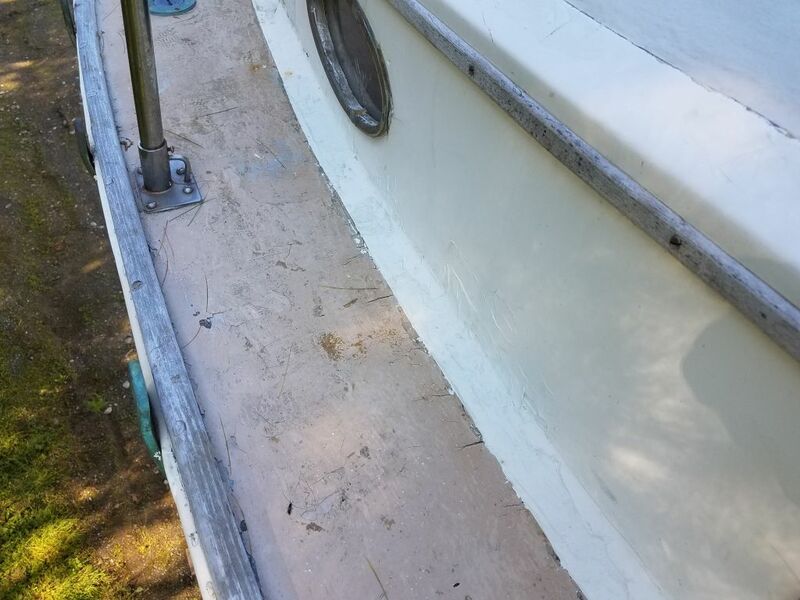 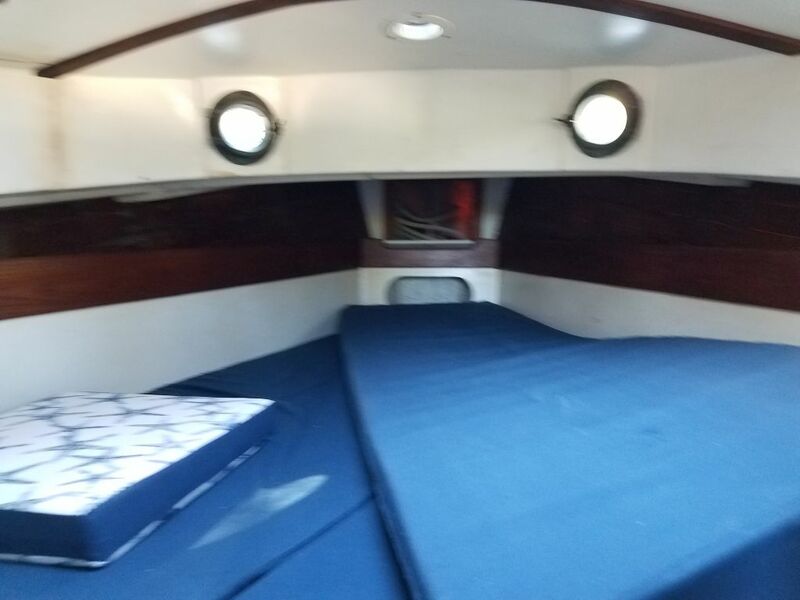 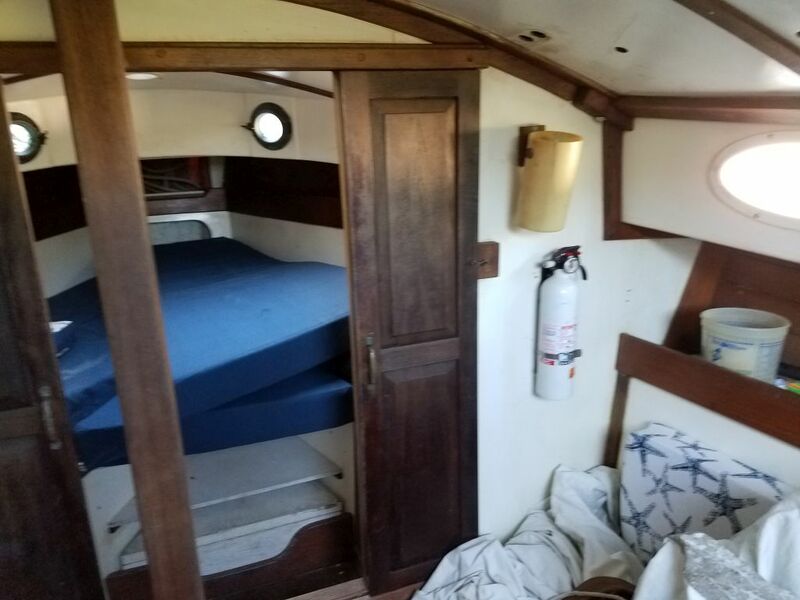 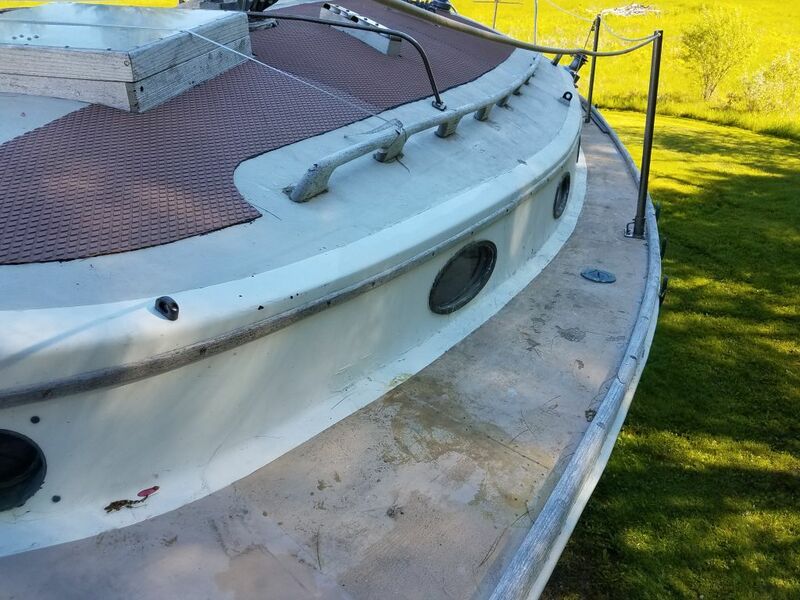 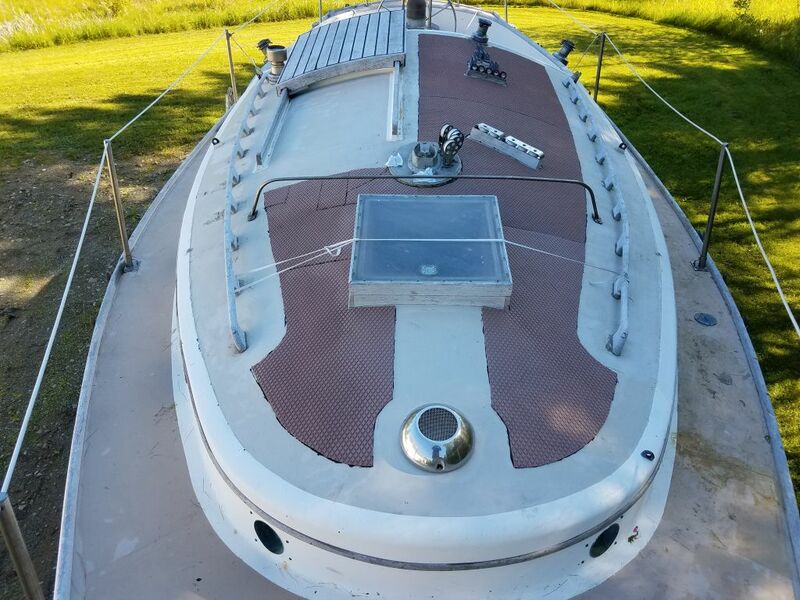 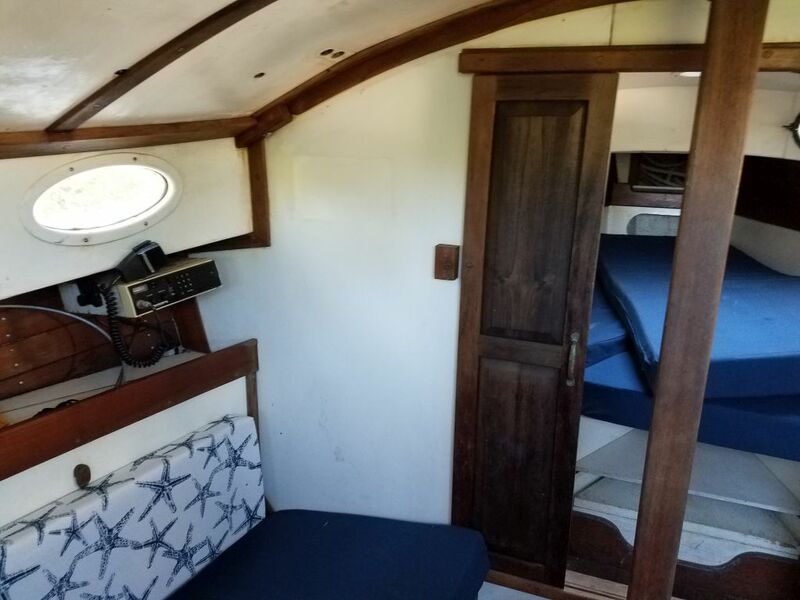 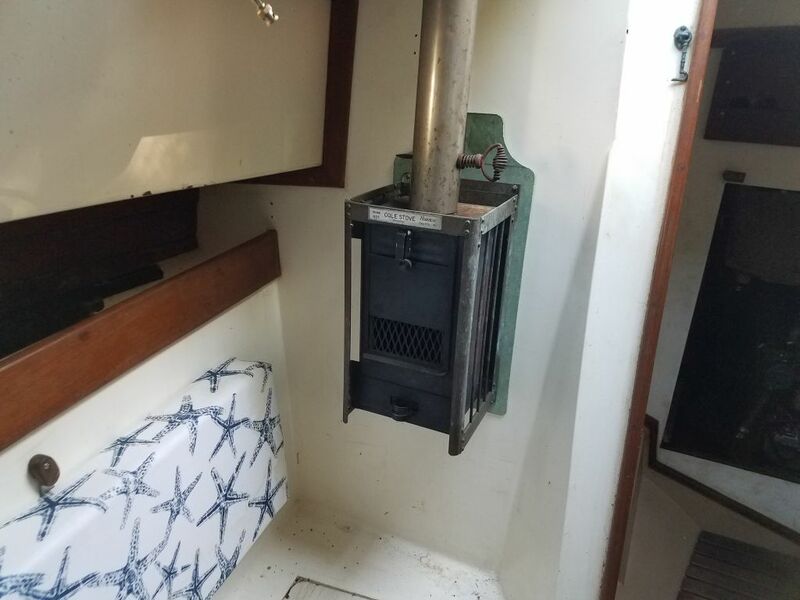 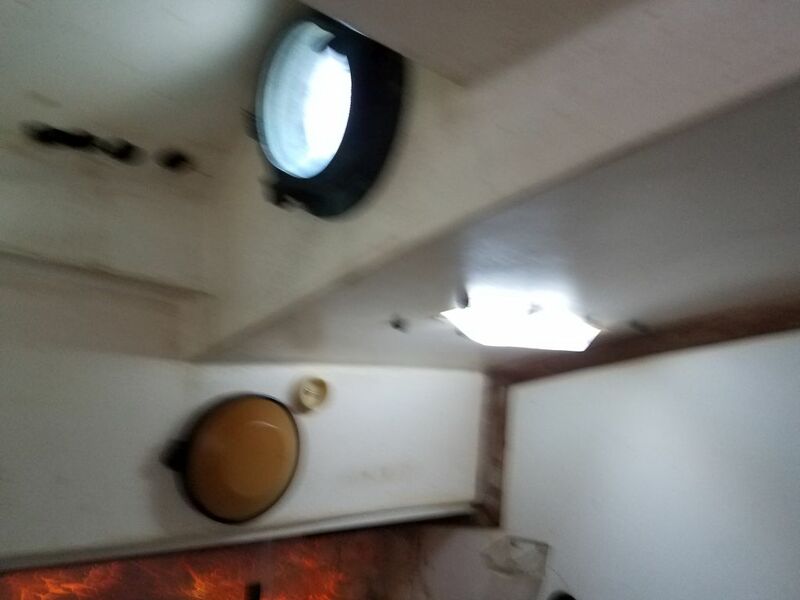 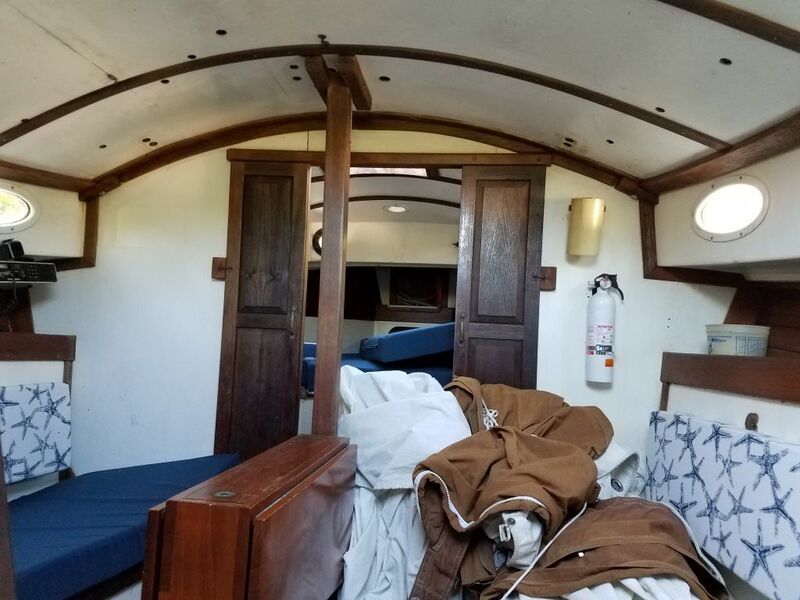 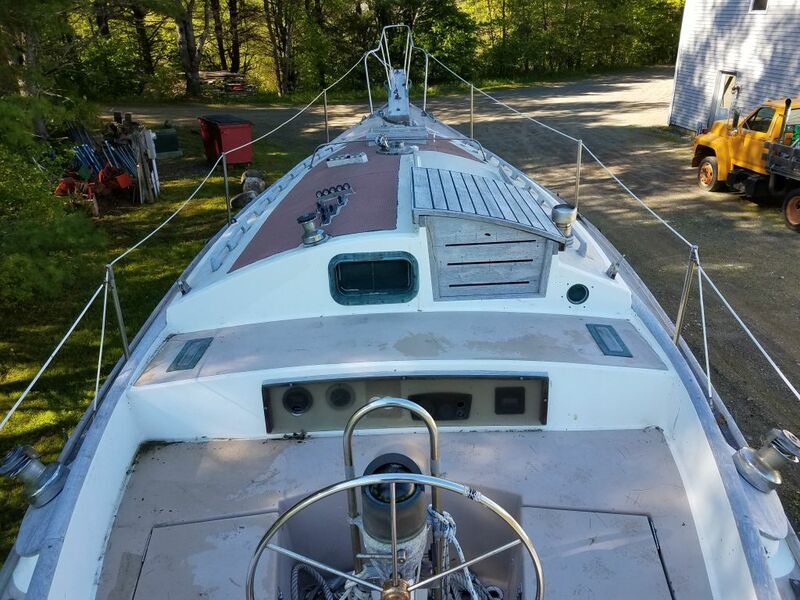 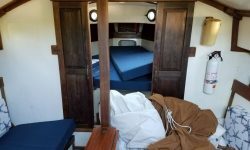 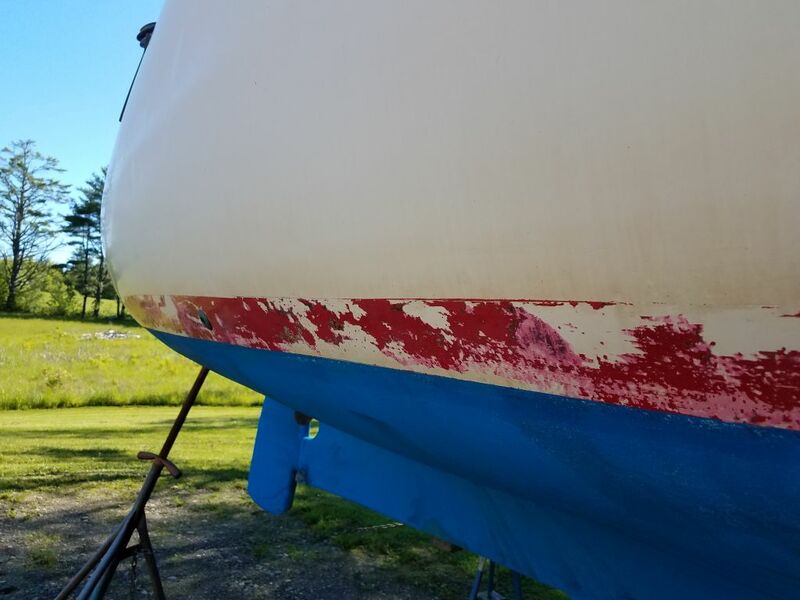 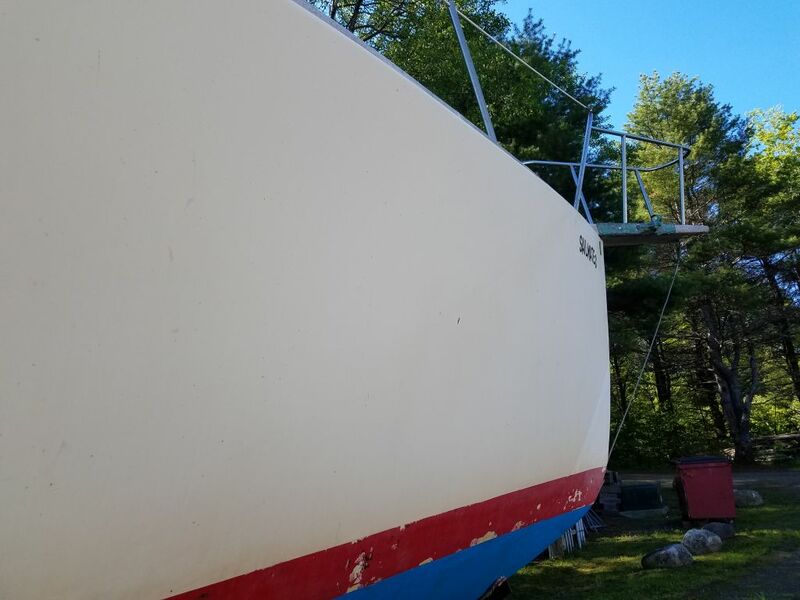 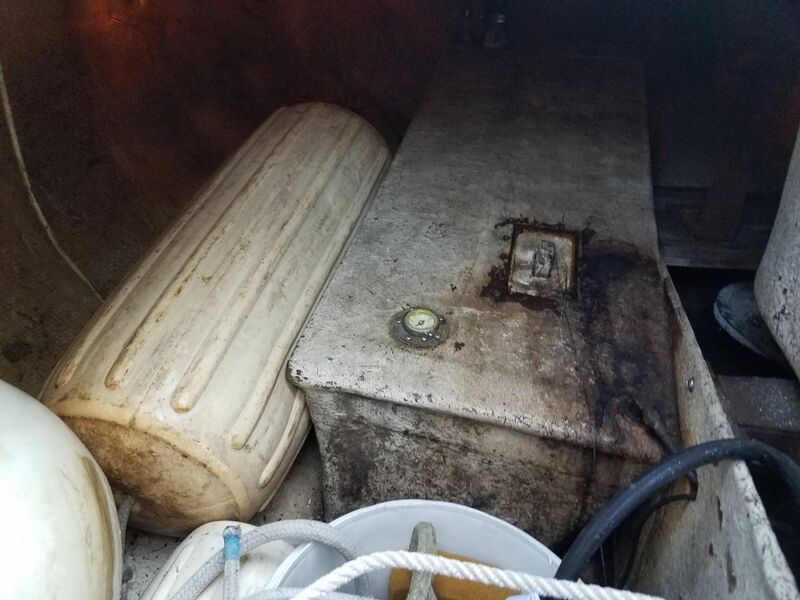 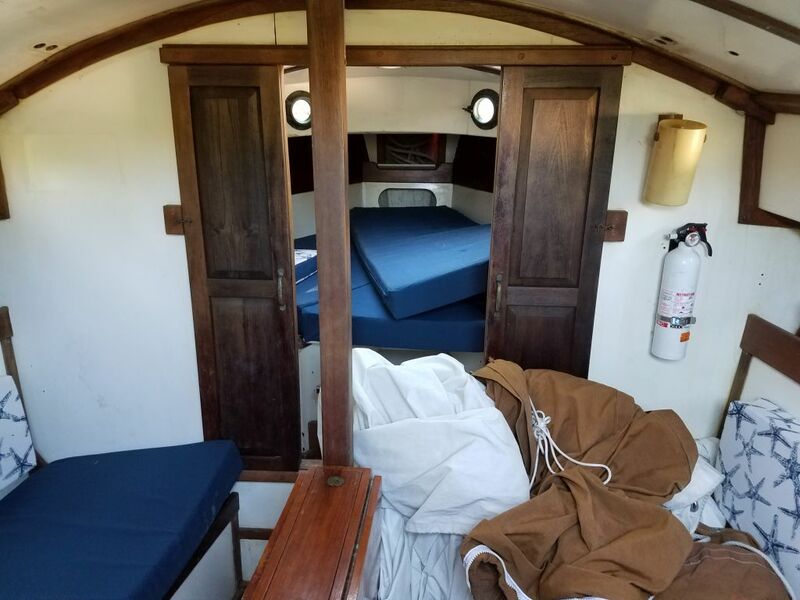 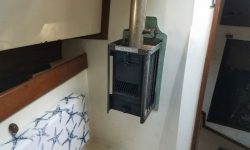 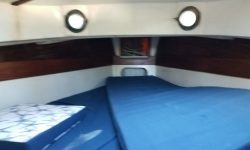 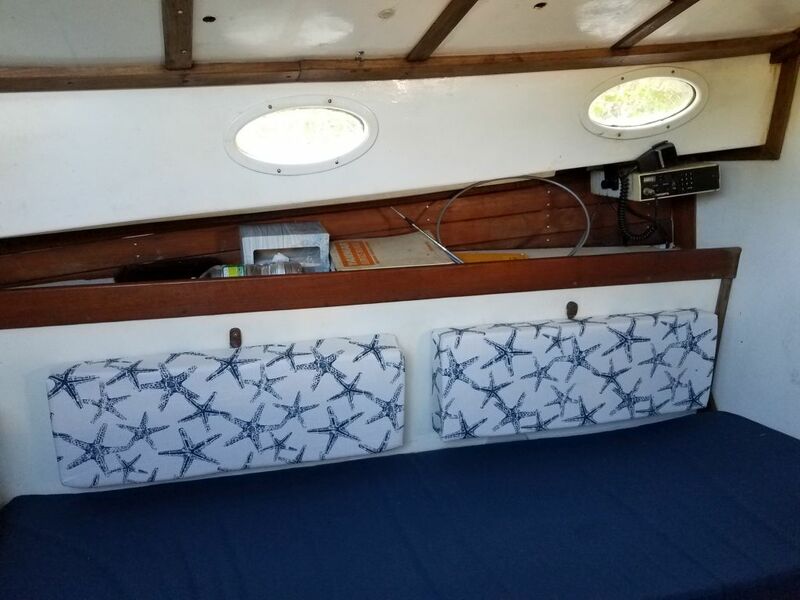 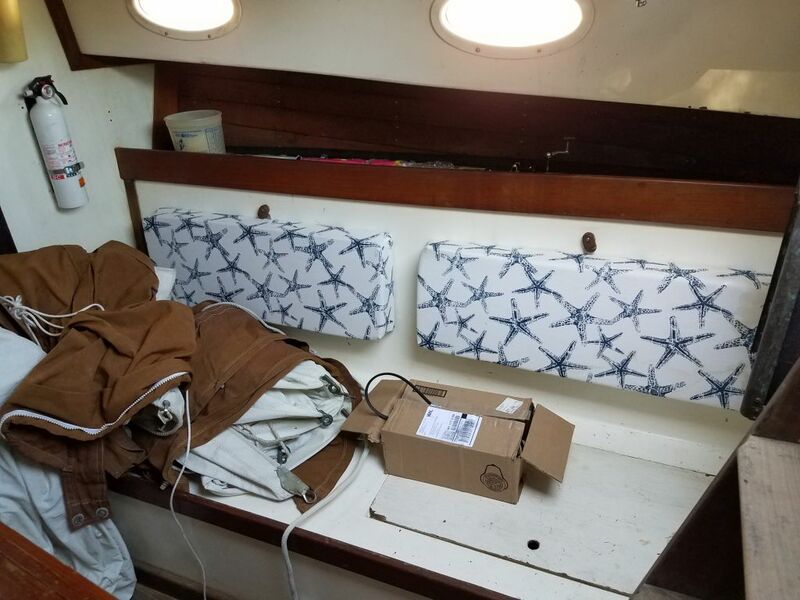 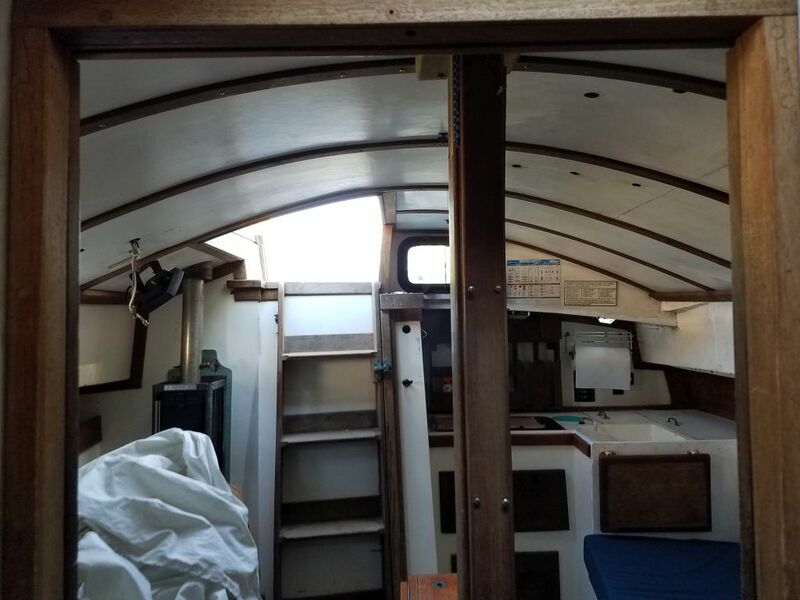 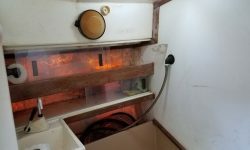 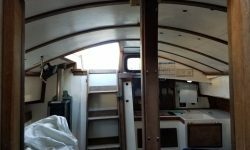 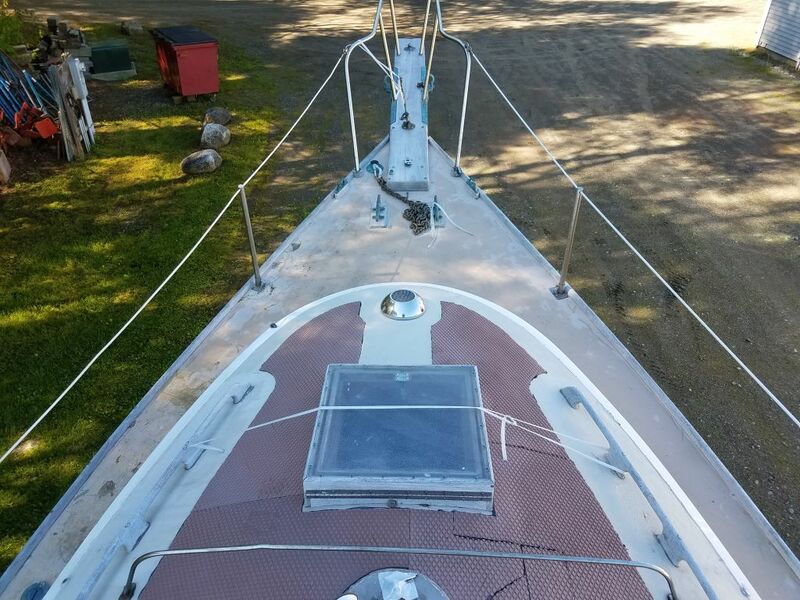 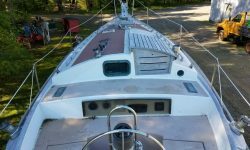 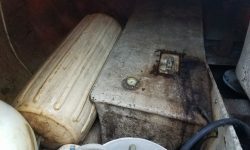 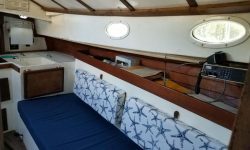 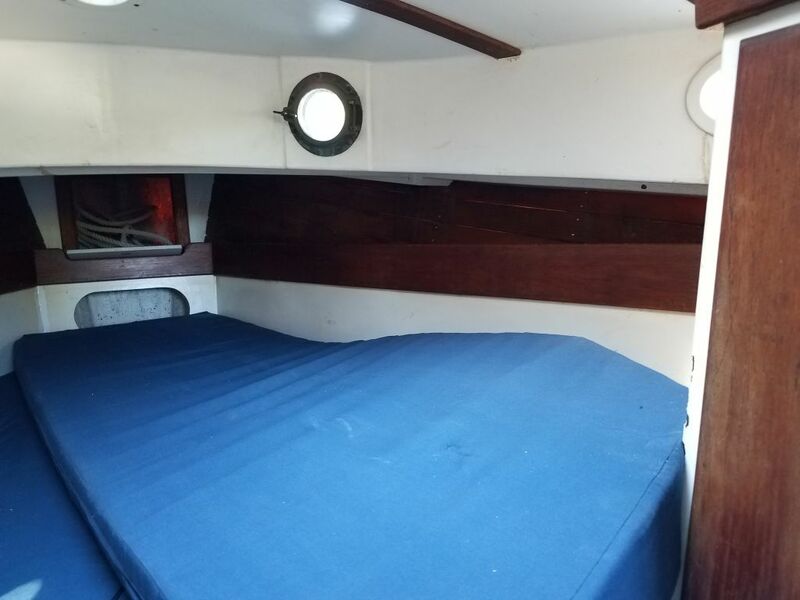 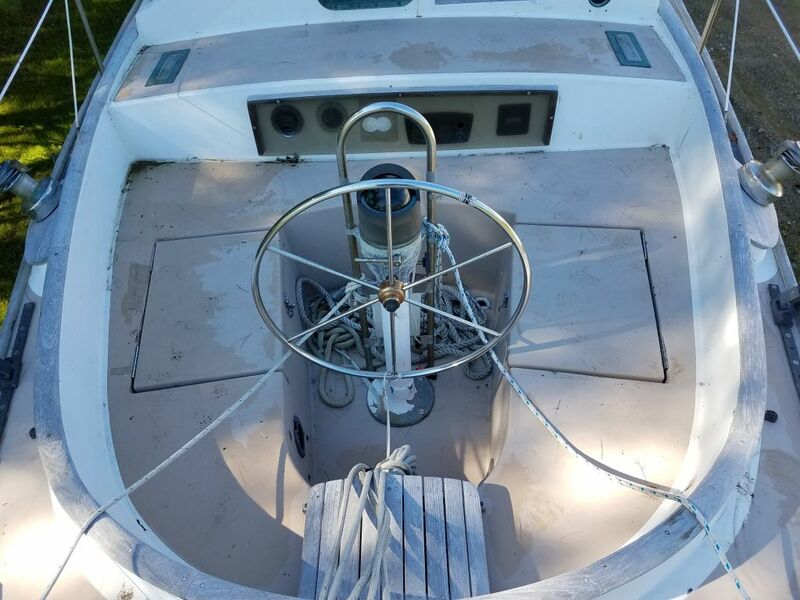 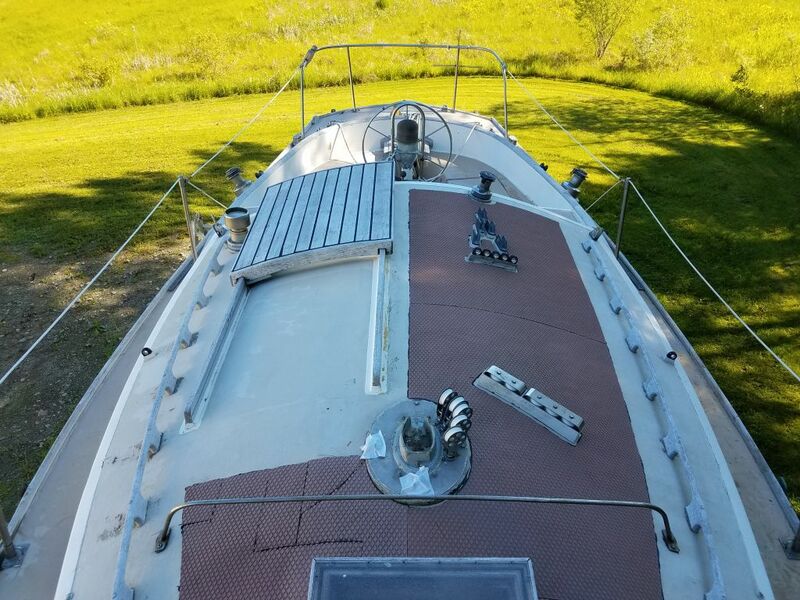 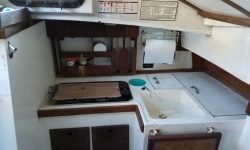 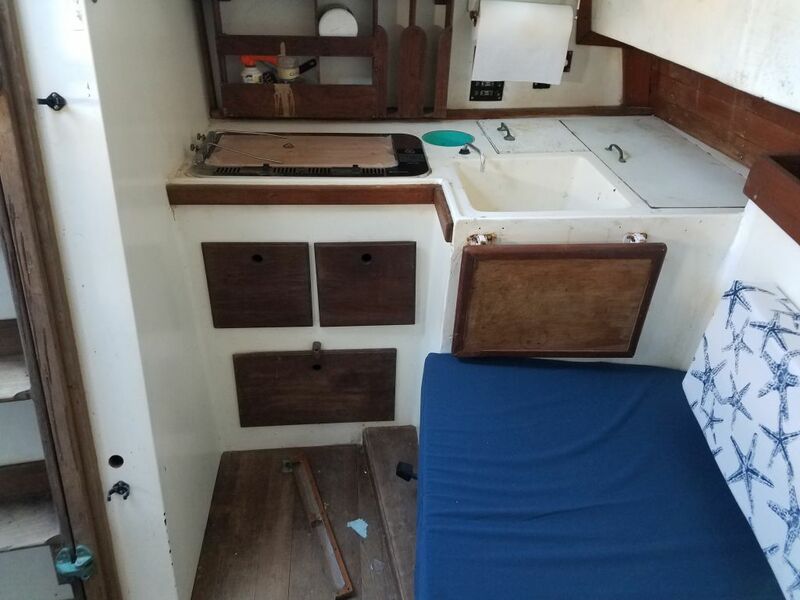 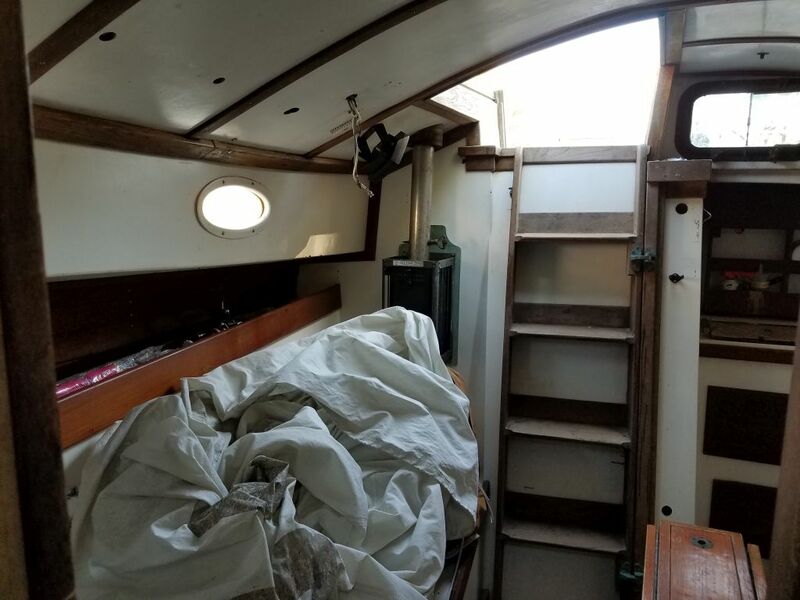 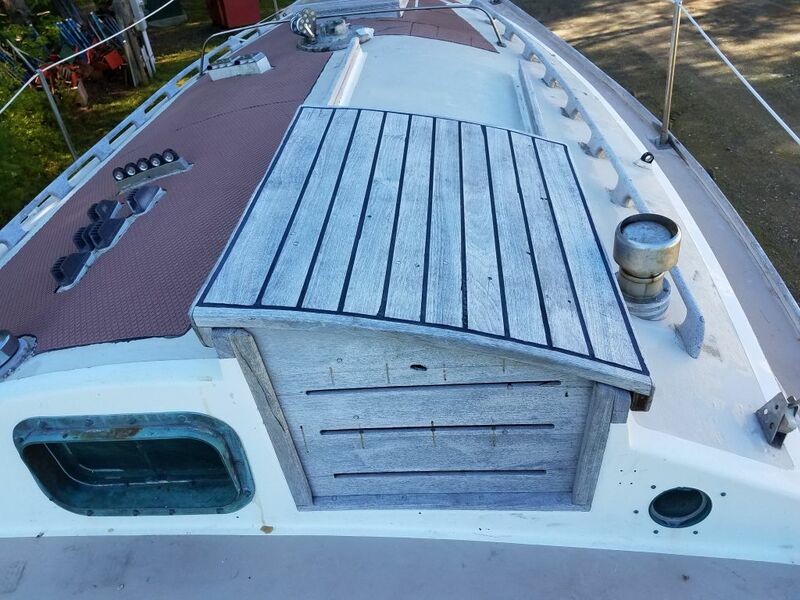 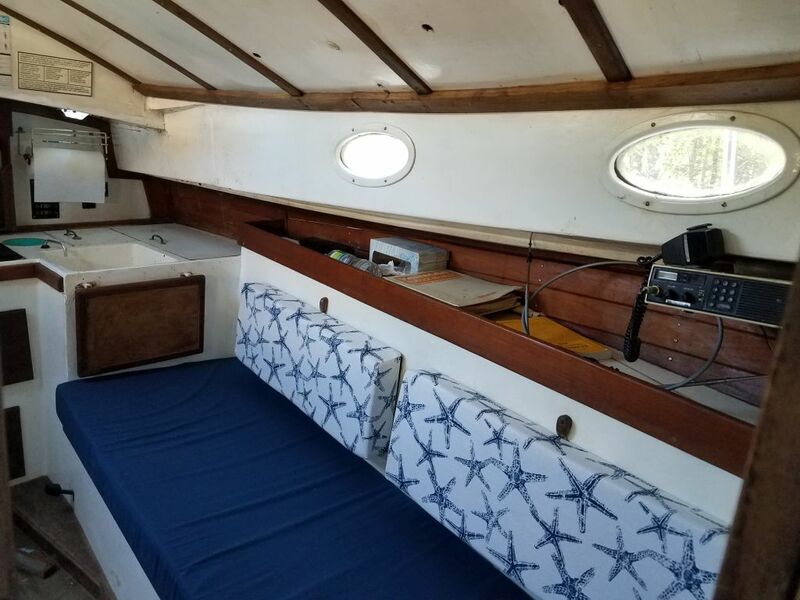 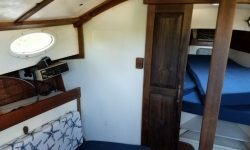 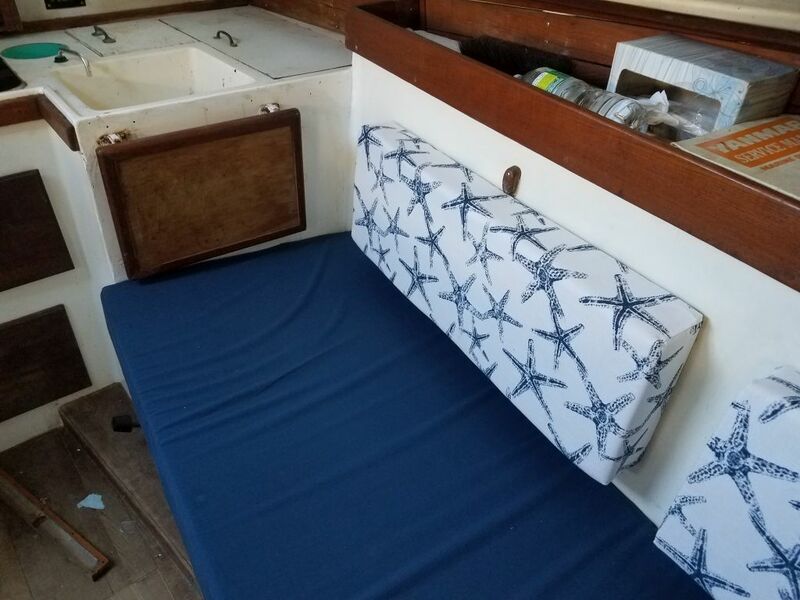 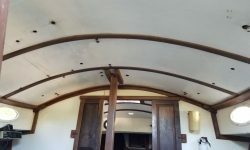 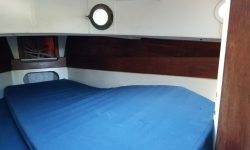 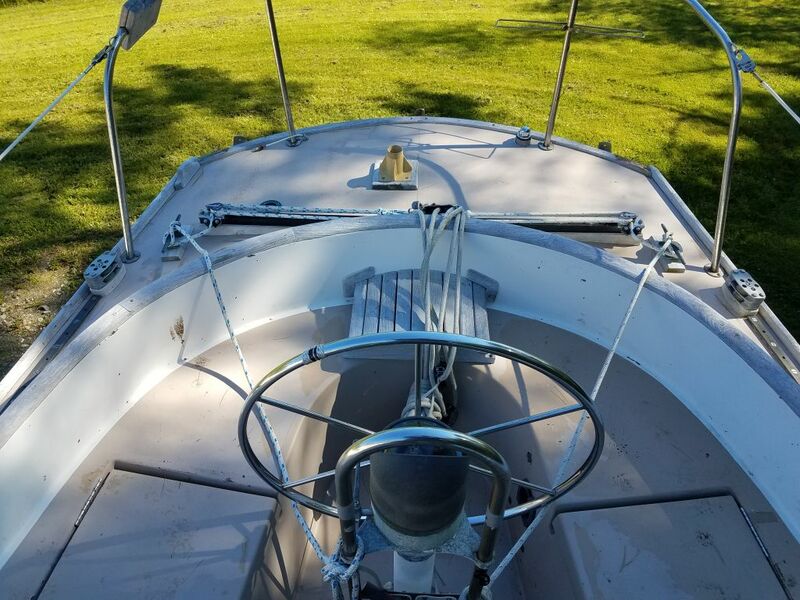 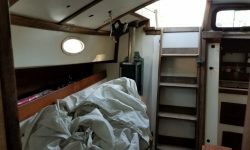 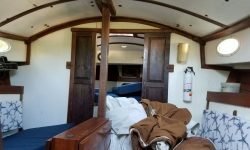 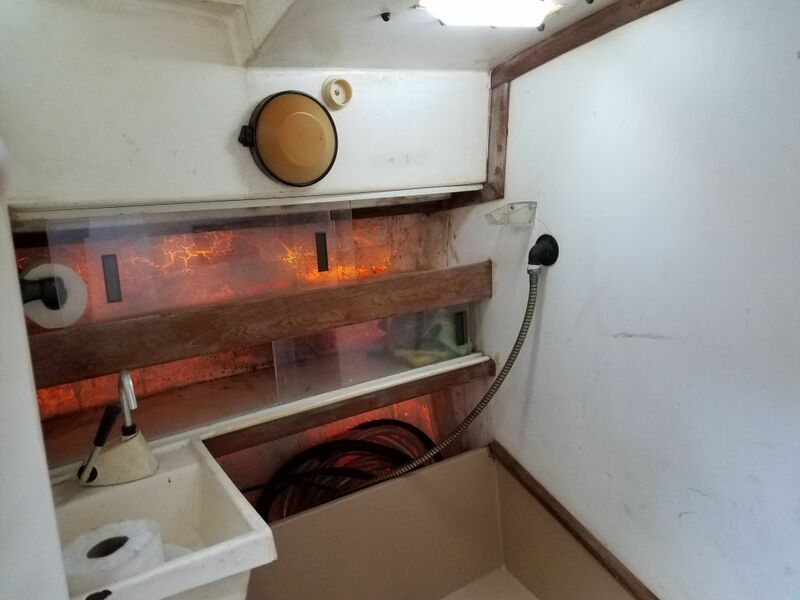 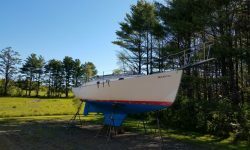 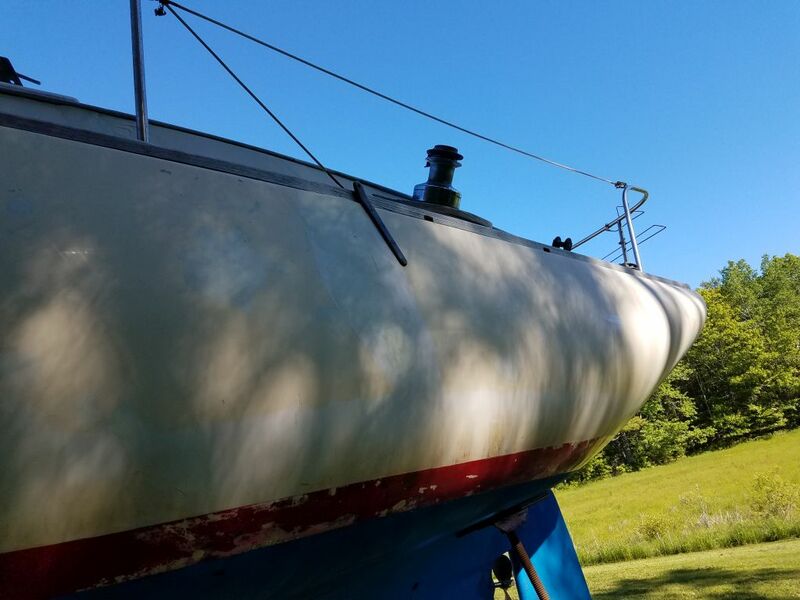 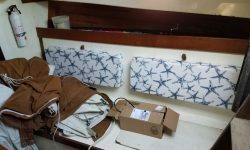 Barring any significant reconfiguration of the interior layout or built-in cabinetry (molded fiberglass with wooden trim in most cases), the interior restoration will revolve largely around cosmetic repairs, enhancements, and upgrades as you see fit for your own vision for the boat. 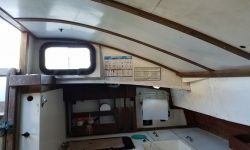 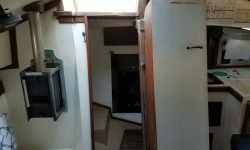 Existing woodwork, at a minimum, should be refinished, but replacement may be worthwhile in some cases. 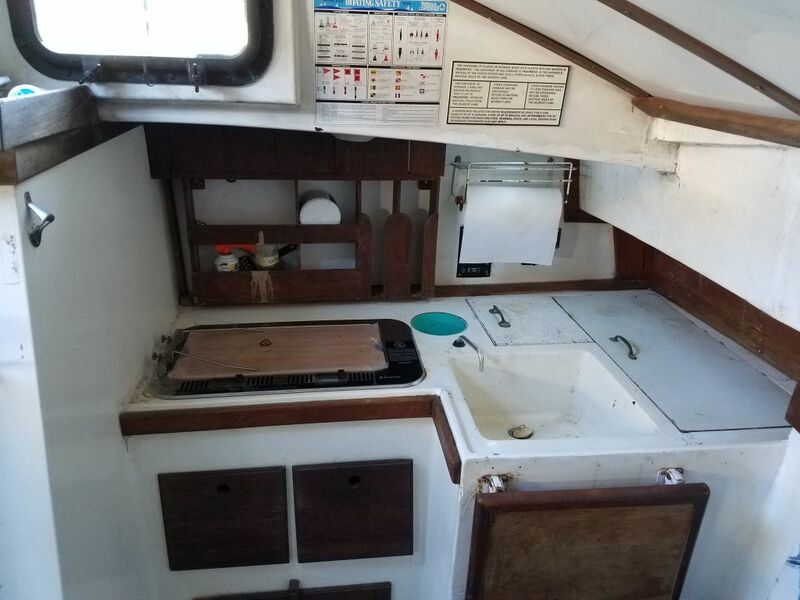 The interior is generally dank and dirty and will require the usual amount of significant cleaning, surface preparations, and refinishing. 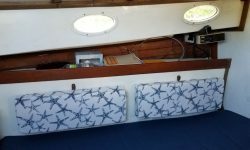 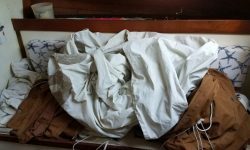 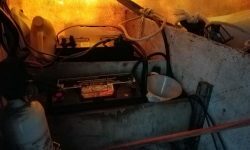 Interior cushions are fair but should likely be replaced. 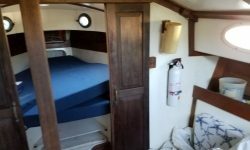 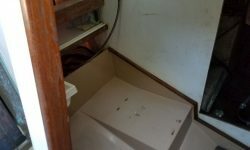 The work list for the cabin will likely be substantial, but the basics appear to be in place and we can work from there. 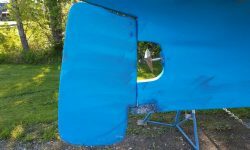 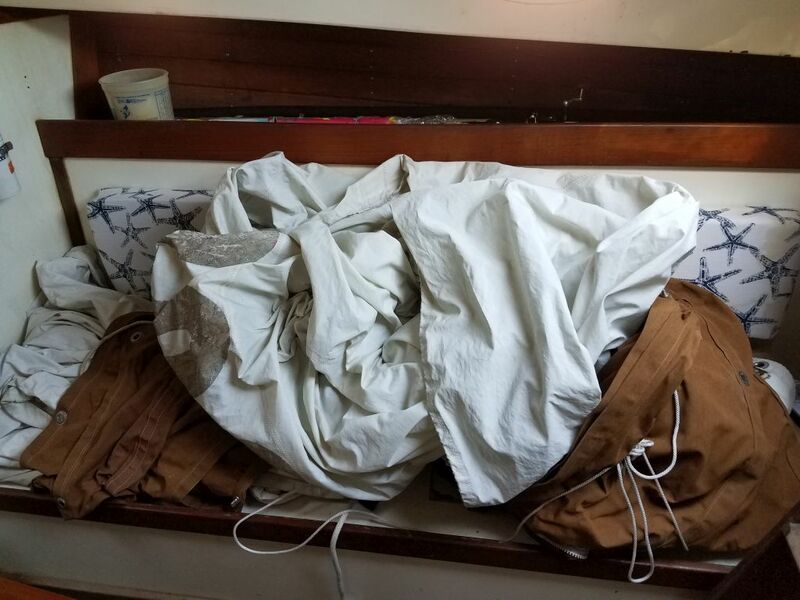 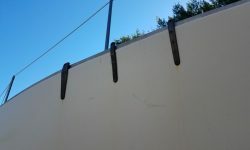 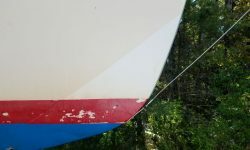 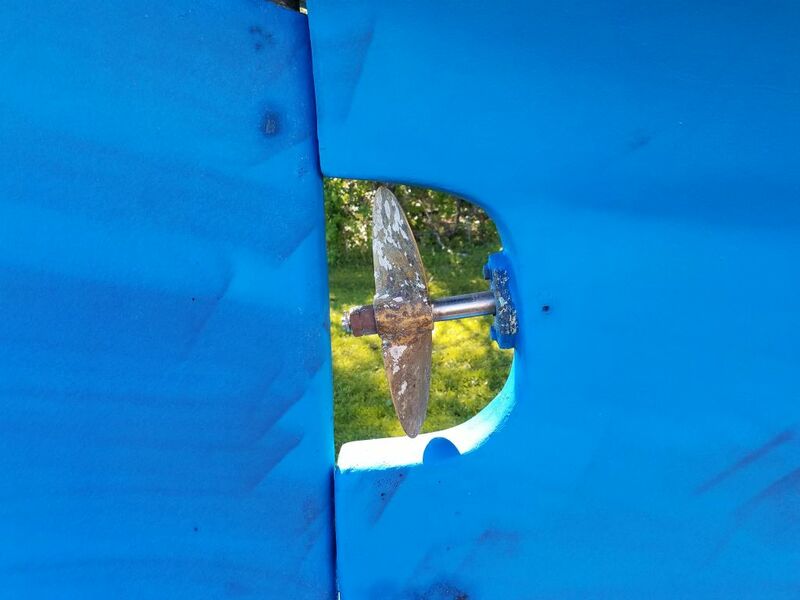 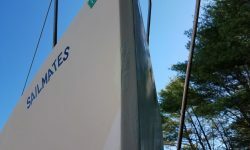 The existing sails and canvas are serviceable, but old and worn. 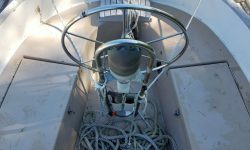 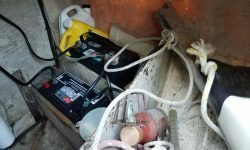 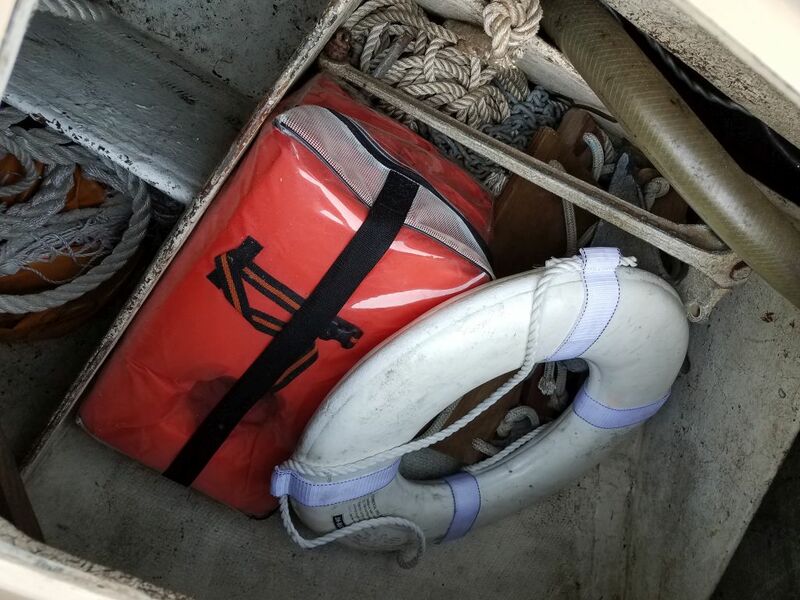 Other equipment, including anchors and rodes, docking equipment, etc. 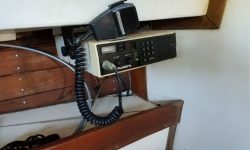 is old and, while serviceable in a technical sense, not generally worthy of re-use. 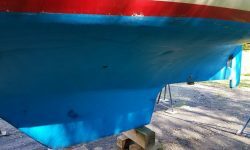 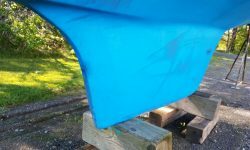 Continuing discussions and the natural progression of work on the boat will help fine-tune the final project scope and needs. 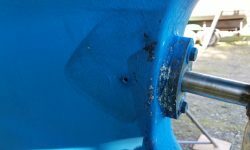 These comments are based only on initial visual inspection, and more will surely come to light as time goes on.